FOREX TECHNICAL ANALYSIS: U.S. JOBS SITUATION: A STEP AHEAD FOR THE DOLLAR OR A PUSH BACK? 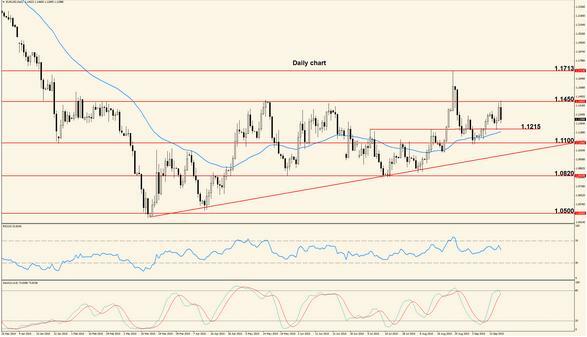 Forex Technical Analysis: Last week’s economic data was mixed and so was the pair’s path. Movement was choppy, with a lot of quick reversals on intra-day charts. Price bounced at resistance but the bears weren’t able to take price below support so uncertainty is still present. The pair tried several times to move above 1.1000 but failed to do so and now rejection candles (long upper wicks) are visible on the Daily chart. The Stochastic is moving upwards but it is starting to curve and price came in close vicinity to a confluence zone created by the 50 period Exponential Moving Average and horizontal resistance. On top of these facts, the main trend is down so we expect this week to belong to the bears. First support, although a minor one, is located at 1.0780, followed by the important level at 1.0500. The first day of the week marks the release of the German Preliminary Consumer Price Index which is the main gauge of German inflation. Since the German economy is of major importance to the entire Euro Zone, the release is likely to have a strong impact. European CPI follows Tuesday. Inflation has been a worrying issue lately because ECB’s target is just below 2.0% and current levels are considered way to low. Wednesday the ADP Non-Farm Employment Change comes out, offering us the first look into the U.S. jobs situation. The report is released by a privately owned company and tries to mimic the more important Government report released 2 days later. Friday many banks around the world will be closed in observance of Good Friday so volatility might be affected but the United States will release the Non-Farm Employment Change which is considered the most important jobs-related indicator. A higher number is beneficial for the greenback because it shows a healthy jobs market and suggests that consumer spending is likely to pick up in the near future. The pair remained inside a tight horizontal channel for almost the entire week although some attempts to break the range were made. Both British and U.S. data was mixed and this contributed to the choppy movement. During every day of the last week the pair tested the support at 1.4830 but the bears couldn’t break the level. We expect the choppy price action to continue during the first days of this week but the pair is under bearish pressure so we consider that a break of the mentioned level will soon follow. If this is the case, price will head towards the next support, which is located at 1.4650 but a bullish break of 1.5000 would invalidate this scenario. Tuesday the British Current Account is released, showing the difference between imported and exported goods during the previous quarter. At the same time the Final Gross Domestic Product is released but this version tends to have the lowest impact out of the three (Preliminary, Second Estimate and Final). The British Manufacturing PMI comes out Wednesday, followed Thursday by the Construction PMI and Friday U.K. banks are closed due to Good Friday so we expect slow trading until the release of the U.S. Non-Farm Payrolls. Forex Technical Analysis: Last week started with the bears in control but the pair moved higher after a bounce at 1.0720 and a disappointing U.S. jobs report. Major resistance wasn’t broken but the downtrend is wavering. The bullish price action was stopped by the resistance at 1.1000 but the pair is supported by a bullish trend line which will be the first barrier if the sellers try to take price lower. To the upside the 50 period Exponential Moving Average combined with 1.1000 – 1.1100 zone will offer resistance and a break would open the door for a move close to 1.1450 which is the next level of interest. Before price will decide direction we expect another encounter with the bullish trend line. Monday many banks around the world will be closed in celebration of Easter and the fundamental scene is pretty slow. The only noteworthy release is the U.S. Non-Manufacturing PMI which is a leading indicator of economic health derived from the opinions of purchasing managers outside the manufacturing sector. Wednesday we’ll keep an eye on European Retail Sales numbers and later in the day the FOMC will release the minutes of their latest meeting, containing in-depth details about the reasons which influenced their latest interest rate vote. Thursday’s only highlight is the release of the U.S. Unemployment Claims while Friday will be another slow day in terms of European and U.S. economic news releases. The entire last week was very slow for the Pound-Dollar pair except for Friday when a worse than expected U.S. employment report drove price higher. 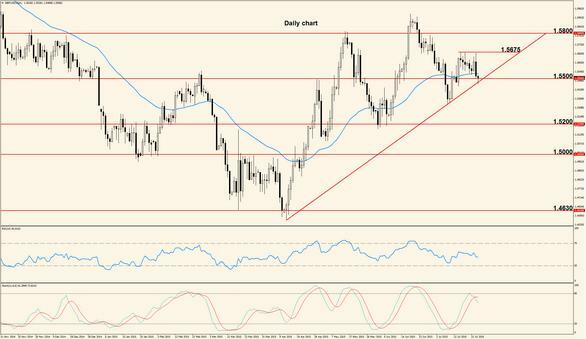 Price sits now above support but resistance is not yet threatened. Lately price moved many times above and below 1.4830 but wasn’t able to move away decisively. The latest move could be what the bulls were waiting for and we might see further upside action. However if the sellers manage to move price quickly below the mentioned level, a new leg of the downtrend might start. The levels to watch this week (apart from 1.4830) are 1.5000 as resistance and 1.4635 as support but keep an eye on the Daily 50 period EMA because it could offer resistance as well. Tuesday the United Kingdom will release the Services PMI which will offer insights into the health of the services sector from the viewpoint of purchasing managers. Wednesday the Bank of England will announce the interest rate decision but since no change is expected yet and no press conference takes place, we don’t believe the event will create strong moves. Friday the British Manufacturing Production numbers come out followed by an estimate of the Gross Domestic Product. The strength of the moves generated by these events will depend a lot on the difference between analysts’ forecast and the actual numbers. As always the pair’s movement will be also affected by the U.S. events. 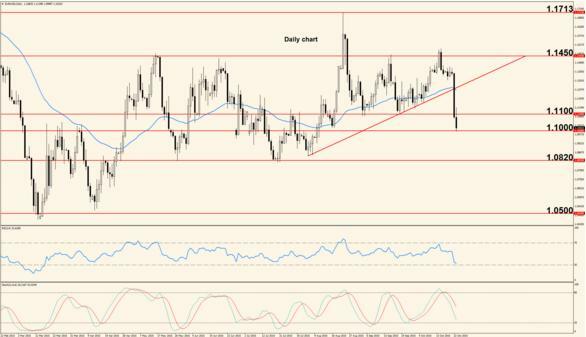 Forex Technical Analysis: Last week the bears took control of the pair and managed to take price almost 500 pips lower. Each day finished lower than it started and only brief bullish movement was seen. The bullish trend line was broken decisively last week after a bounce at the 50 period Exponential Moving Average on a Daily chart and now the bears are in control of the pair. The oscillators don’t indicate oversold condition but we expect price to pause or even bounce higher if the important support at 1.0500 is reached. First potential resistance is located at 1.0720 but the bias remains bearish, with the possibility of bullish pullbacks. Monday the fundamental scene is slow and no major news is released but Tuesday an important economic indicator will affect the US Dollar: the U.S. Retail Sales. The Fed is closely watching how the economy performs and an increase in sales made at a retail level could mean that we are one a step closer to a rate hike. Wednesday the ECB will announce the interest rate and President Mario Draghi will hold a press conference which will offer more details about future monetary policy. The press conference is almost always accompanied by strong reaction on euro related pairs so caution is recommended. Thursday keep an eye on the U.S. Building Permits and Friday the U.S. CPI will be the main market mover because this is one of the most important gauges of inflation. 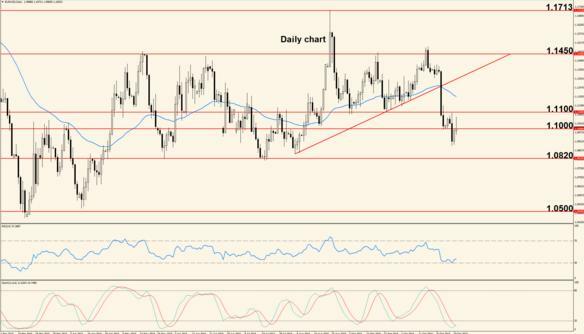 Dollar strength was seen against the Pound as well and the pair traveled south for the entire week, breaking the important support located at 1.4830. The Bank of England kept the interest rate unchanged at 0.50% and didn’t offer hints about the next increase. 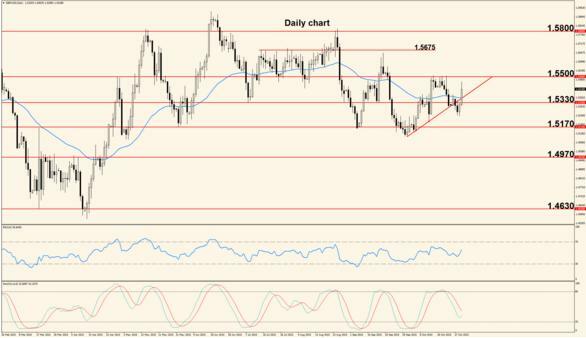 After breaking 1.4830 decisively the pair traveled into the support located in the zone around 1.4635 but although the week finished below this level, the break cannot be considered valid yet. However, as long as price remains below 1.4830, the bias is negative and we expect the downtrend to continue. If this is the case, the next support is located around 1.4350, a level better seen on a Weekly chart. British inflation data comes out Tuesday in the form of the Consumer Price Index and Friday we will get insights into the British unemployment situation once the Claimant Count Change is released. Other than that the Pound has a slow week in terms of news releases and center stage will be held by the U.S. announcements. 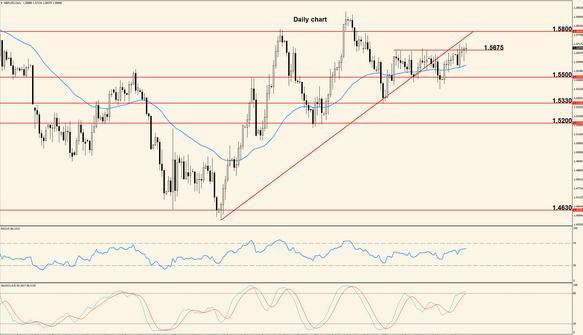 Forex Technical Analysis: Last week the bulls managed to take the pair higher after a move close to key support. 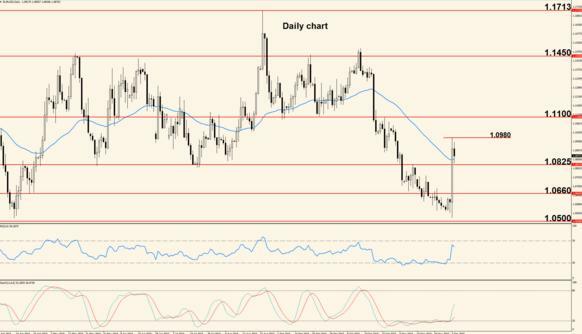 The U.S. economic data released throughout the week didn’t match analysts’ expectations and this allowed the euro to edge higher. 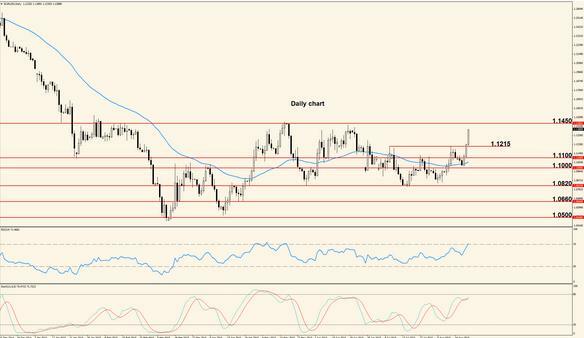 The support zone around 1.0500 proved strong last week but the climb is not a trend changer. It is normal for price to make several attempts before breaking an important level so we still consider that a move below 1.0500 is possible. There is strong resistance in close vicinity of price, represented by the daily 50 period Exponential Moving Average and by a bearish trend line visible on the chart above. If this resistance zone is surpassed, the next place where bearish movement can resume is located at 1.1000. The week ahead is headlined by the Eurogroup Meetings which take place Friday. The meetings carry extra weight this time because a solution must be reached for the Greek debt problem. There have been talks about a potential Greek separation from the European Union if progress in the debt issue is not made but so far an exit remains questionable. Before the Eurogroup Meetings take place the German ZEW Economic Sentiment Survey is announced Tuesday, showing the opinions of professional investors and analysts about the state of the German economy. Thursday the German and French Manufacturing PMIs are released and Friday we will take a look info U.S. Durable Goods Orders. This indicator focuses on changes in orders for goods with a life expectancy of at least 3 years. Because these goods are usually more expensive, an increase in demand shows that consumers are willing to spend money and this leads to increased economic activity. The week that just ended belonged almost entirely to the bulls and the pair traveled about 500 pips to the upside before retracing slightly lower. Resistance was pierced but the week finished below it, mostly due to profit taking on long positions. The last daily candle has a long upper wick and is commonly known as a pin bar. This is a sign of rejection and shows that 1.5000 might be the place where bearish price action resumes. Price is sitting on the 50 period Exponential Moving Average and for now we cannot make any prediction about a break or bounce scenario but a move below this dynamic resistance would increase the chances of an extended drop. 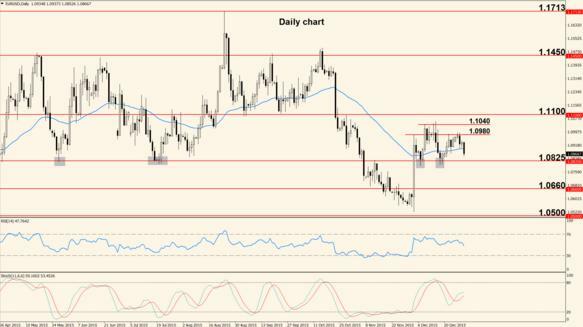 The levels to watch this week are 1.4830 as support and 1.5000 as resistance. The Pound has a slow economic week ahead, with only two notable releases: Wednesday the Bank of England will reveal the votes on the latest rate decision and although no change in the structure is expected, it’s a good opportunity for traders to gauge the overall stance of the BoE regarding a rate hike. Thursday the British Retail Sales come out; the impact of this indicator is usually high because sales made on a retail level represent a major part of the economy. 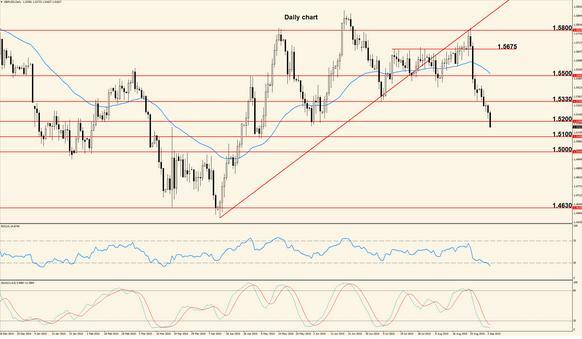 Forex Technical Analysis: Last week was characterized by mixed trading scenarios and ranging price action as European and American data failed to meet analysts’ expectations. The Eurogroup Meetings didn’t bring a solution to the Greek crisis and tension grew higher between Greek representatives and European Finance Ministers. We saw an attempt to break 1.0720 to the downside, which resulted in a bullish bounce higher, and now price is attempting to move above the resistance zone created by the bearish trend line and the 50 period Exponential Moving Average. The Stochastic is crossed bullish and the lines are spread apart, indicating buyer momentum and the Relative Strength Index is also moving upwards without being overbought. These are bullish signs which suggest that we are likely to see a break of immediate resistance followed by a move into 1.1000 zone but turmoil in the Euro area might have a negative effect on the common currency and in this case the pair is likely to move below 1.0720. The week starts slow, with no major releases occurring Monday. Tuesday an American Consumer Confidence survey is the main headline while Wednesday will be the busiest day of the week for the US Dollar as the Advance Gross Domestic Product is released, followed later in the day by the Federal Funds Rate decision and the FOMC statement. Although the rate is not expected to change, the Statement is likely to reveal hints about the next increase, which is rumored to happen in June or July. Thursday a Flash Estimate of the European Consumer Price Index comes out, offering insights into the always-important European inflation and the trading week closes Friday with the release of the U.S. Manufacturing Purchasing Managers’ Index which acts as a leading indicator of economic health. 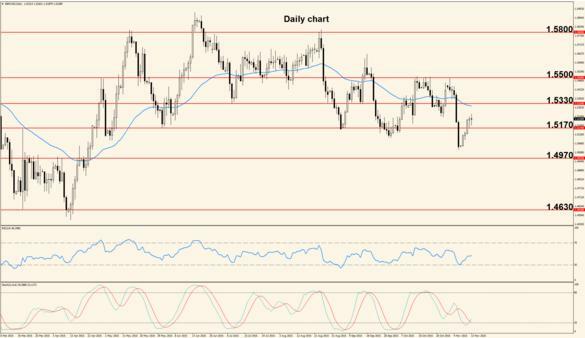 After a slow start of last week’s trading, the Pound rallied and the pair climbed above 1.5160 resistance. The U.S. economic data released throughout the week disappointed and this contributed to the pair’s rise. Although the week finished above 1.5160 resistance, we cannot consider this a true break yet. The oscillators are approaching overbought and from a long term perspective the pair is still in a downtrend so we believe that bearish price action will take place this week. Keep in mind that bulls managed to break resistance levels last week so currently they have the upper hand. The British Preliminary Gross Domestic Product is released Tuesday. The GDP is an economy’s main performance gauge and the Preliminary version is the most important out of the three (Preliminary, Second Estimate and Final) so we expect it to have a strong impact on the Pound. Friday the British Manufacturing PMI comes out, showing the opinions of purchasing managers about the state of the manufacturing sector. As always, the pair’s movement will be directly affected by the U.S. data that comes out throughout the week. Forex Technical Analysis: The euro showed clear signs of strength last week, compared to the US Dollar which weakened mostly due to the Fed’s neutral stance regarding an interest rate hike. The entire week was controlled by euro bulls and important resistance was broken. Once the bearish trend line was broken the pair skyrocketed through 1.1000 and 1.1100 resistance, reaching a high of 1.1290 and making the medium term outlook bullish. The next key level is located at 1.1450 but before this is reached we expect price to retrace lower. The last daily candle of the week shows a long upper wick which is a sign of rejection and both the Relative Strength Index and Stochastic are overbought; these are hints that a retracement is due but the main bias is bullish. First resistance is located in the zone created between 1.1100 and 1.1000. The dollar has an important week ahead considering that employment data is released. Tuesday the U.S. Trade Balance will show the difference between imported and exported goods and services while Wednesday, Automatic Data Processing Inc. will release their version of the Non Farm Payrolls. Although this report is not as important as the Government jobs data released two days later, its impact can be strong so caution is recommended. The same day Eurozone Retail Sales numbers come out. The most important event of the week is undoubtedly the U.S. Non Farm Employment Change (Non Farm Payrolls) released Friday. This is a report that shows how many new jobs were created during the previous month, excluding the farming industry and is widely considered the most important employment related indicator for the U.S. economy; its impact is almost always huge, with higher numbers strengthening the greenback. 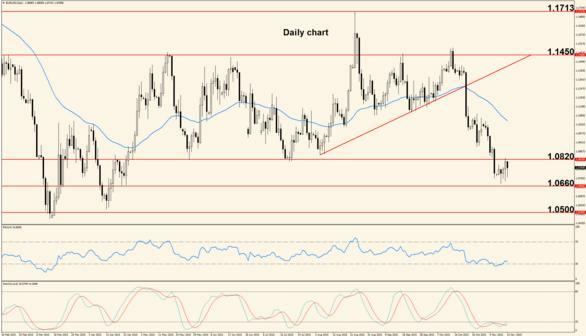 The Pound was severely hit by disappointing economic data and a substantial selloff started after an initial climb above resistance. The weekly candle is a huge bearish pin bar which shows rejection and potential downtrend resumption. The resistance at 1.5550 was threatened last week but bears took over and the pair finished below 1.5160. This week we expect price to stall at this level before deciding the next direction; the 50 period Exponential Moving Average is in close vicinity and a touch of this dynamic support is very likely. Both oscillators are moving out of overbought with strong momentum, increasing the chances of further downside movement and making 1.5000 the next target. A bounce higher would open the door for another attempt to break 1.5550. Monday UK banks are closed, celebrating May Day this no economic indicators are released. Tuesday the focus is on the Construction Purchasing Managers’ Index and Wednesday the Services PMI comes out. Thursday will probably be the most important day of the week as the British Parliamentary Elections take place. This event is likely to create turmoil on the markets so we recommend caution if trading Pound pairs during the day. The U.S. employment report will also have a direct and strong impact on the pair’s movement. Forex Technical Analysis: Last week the pair came close to the resistance at 1.1450 but the bulls ran out of steam before a touch could occur. The U.S. employment data was mixed (previous number revised lower) and this created choppy movement Friday. Although 1.1450 wasn’t threatened last week, we saw an attempt to go below 1.1100 which failed and instead price bounced at this support after a Daily pin bar. The indecision created by the Non-Farm Payrolls is likely to wane off early this week and this means that either 1.1100 or 1.1450 will be broken. The 50 days Exponential Moving Average is moving upwards but both the Stochastic and the Relative Strength Index are starting to move down coming from overbought; these are mixed signals which might generate a ranging week. The week starts with the Eurogroup Meetings held Monday and attended by finance ministers from the member states. The Greek debt issue will take center stage again and could generate strong movement if important conclusions are reached. Otherwise we will probably see more of choppy price action. Wednesday the Preliminary German Gross Domestic Product is released, offering insights into the state of the German economy which as we know is a pillar of the entire Eurozone. The same day the U.S Retail Sales are announced, showing the change in the volume of sales made at retail outlets. Thursday Swiss, French and German banks will be closed in observance of Ascension Day and this might have a negative impact on volatility, while the US Dollar will be affected by the Producer Price Index and Unemployment Claims release. Friday is a slow day with the US Consumer Sentiment being the only highlight. The British Parliamentary Elections were last week’s headline for the Pound-Dollar pair as they created huge Pound strength and generated a surge that threatened 1.5550 resistance. The entire week was bullish and we expect this strength to perpetuate itself during the week ahead. The resistance at 1.5550 is the first barrier in front of rising price and a move above it would solidify the medium term control of the bulls. Currently price is sitting above the 50 period Exponential Moving Average and above 1.5160 support zone so our bias is bullish but a bounce at 1.5550 resistance combined with a turn of the moving average or the oscillators would suggest a bearish retracement. Monday the Bank of England will announce their decision regarding the interest rate but no change is expected so the event might go mostly unnoticed. Tuesday the British Manufacturing Production numbers come out, followed by a NIESR Estimate of the Gross Domestic Product; although this is just an estimate, its impact is usually high due to its accuracy. Wednesday will be probably the most important day of the week for the Pound because the Claimant Count Change will offer important insights into the British jobs market and Bank of England Governor Mark Carney will hold a press conference with the Inflation Report (released at the same time) being the main topic. The rest of the week lacks major economic releases for the Pound but as always the U.S. events will have a direct impact on the pair’s movement. Forex Technical Analysis: The previous week was controlled by the bulls as the euro strengthened on advances made in the Greek bailout conundrum. American Retail Sales and consumer confidence indicators failed to meet analysts’ expectations, dealing a blow to the US Dollar. The pair is supported by a bullish trend line but it’s currently testing 1.1450 resistance, with mixed Stochastic and Relative Strength Index (the oscillators are close to overbought but are not showing an extreme condition). A break of 1.1450 would bring in more buyers and generate another bullish week but a false move above the mentioned level would indicate a potential reversal and resumption of the long term downtrend making the bullish trend line the first target. The German ZEW Economic Sentiment – released Tuesday – is the week’s first notable indicator, showing the opinion of about 275 German investors and analysts about the state of the economy. The same day the American Building Permits numbers come out, offering insights into the health of the U.S. construction sector. Wednesday’s main event is the release of the FOMC Meeting Minutes which show some of the reasons which stood behind the Fed’s latest interest rate decision and often offer hints about future monetary policy. Thursday we will get insights into the French and German manufacturing sector as their respective Purchasing Managers’ Indexes are released while Friday’s headline will be the U.S. Consumer Price Index which in one of the broadest measures of inflation. 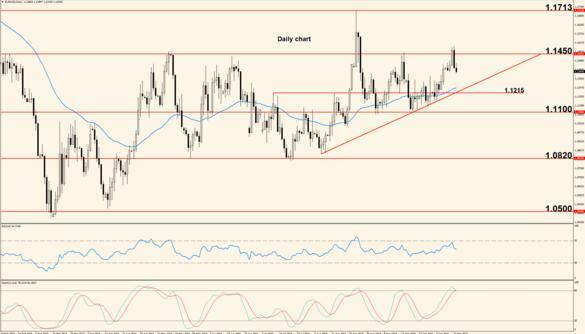 US Dollar weakness was seen against the Pound as well and the pair had another bullish week, with price moving above resistance. Early last week the bulls took price through 1.5550 and continued higher for the rest of the period. However during the second part of the week, the advance slowed and we even saw a bearish day. This fact combined with 1.5830 resistance and the overbought condition of the Stochastic and Relative Strength Index shows that a deeper retracement has high chances of occurring. The first support is located at 1.5550 followed by the bullish trend line. Wednesday the Bank of England will make public their votes on the interest rate but no change in the stance of the Monetary Policy Members is expected. Nonetheless the event is considered high-impact and should be watched carefully as it may trigger sharp moves. The other important event of the week is the release of the British Retail Sales scheduled Thursday. This type of sales represents one of the biggest parts of economic activity and usually affects the Pound strongly. Friday BoE Governor Mark Carney will participate in a discussion at the ECB Forum titled “Inflation and Unemployment in Europe”; his speech is likely to affect the Pound as well so caution is recommended. Forex Technical Analysis: The bears started last week strong and they maintained control over the pair for the entire period. 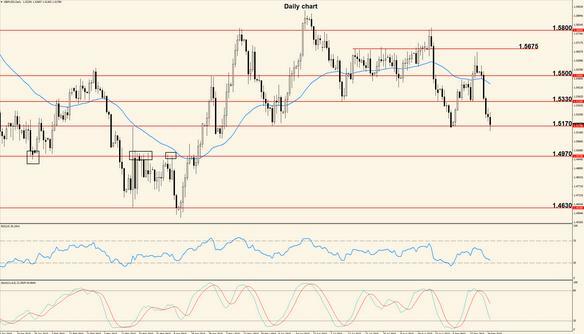 The resistance at 1.1450 was too strong to break and a bounce generated a drop of more than 400 pips. Important types of support were broken last week: the 50 period Exported Moving Average on a Daily chart, the bullish trend line and the horizontal level at 1.1100. This puts the control on the bears’ side but it’s important to note that currently price reached a support zone created between 1.1100 and 1.1000. If the pair travels below this zone, we are likely to see further downside movement, with 1.0720 being the first target. Both oscillators are well directed, suggesting that such a move is possible but a bounce back above the 50 EMA and 1.1100 may invalidate such scenario. Monday most European banks are closed in observance of Whit Monday and US banks are closed due to Memorial Day so we expect a slow or irregular trading session. Tuesday the dollar will be affected by the release of the US Durable Goods Orders and later in the day by a Consumer Confidence survey while Wednesday the main event will be the G7 (Group of 7) Meetings which will probably have a strong impact on both the euro and the dollar. The meetings will continue Thursday and Friday; the rest of the events which will have an effect on the pair are the US Unemployment Claims released Thursday and the German Retail Sales scheduled Friday. Although last week was bearish, the Pound benefited from a better than expected value of the British Retail Sales which generated some strength. 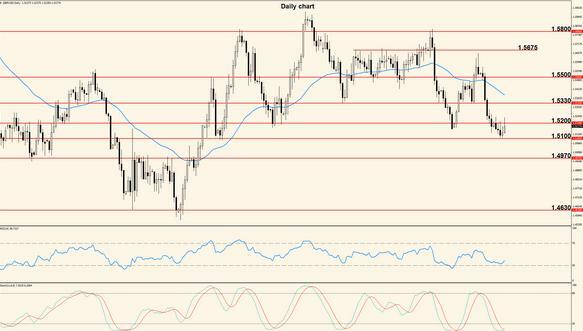 The climb was erased Friday when the US inflation data came out. The bullish trend line on a Daily chart was broken but the Pound still has enough strength for another bullish push. However, as long as price remains under 1.5550, the picture is bearish and we expect a move south into the 50 days Exponential Moving Average. Both oscillators are coming out of overbought territory and show good momentum, increasing the chances of such a drop. Monday British banks are closed celebrating Spring Bank Holiday so the fundamental scene is calm. In fact the entire week is slow, with the only notable release being the Second Estimate of the British Gross Domestic Product scheduled Thursday. The United Kingdom is part of the Group of 7 so the Pound will be affected by the G7 Meetings. Forex Technical Analysis: Last week finished with price at almost the same level it started as the bears controlled the first part and the bulls took over in the second part of the period. 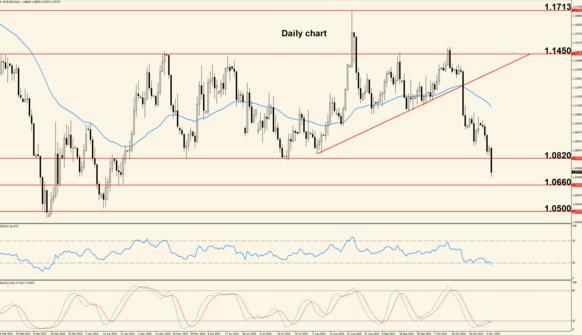 The euro was weakened by Greek crisis concerns while the US Dollar was hit by a disappointing GDP. 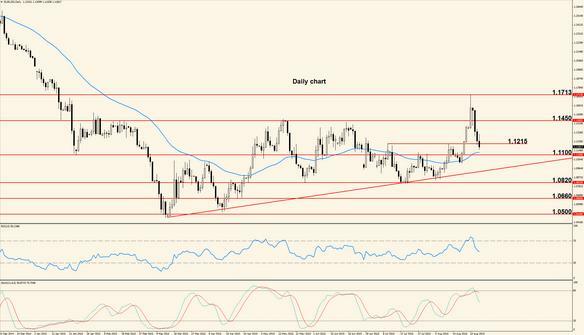 We saw an almost perfect bounce at 1.0820 support which generated a move into 1.1000 resistance. As mentioned before, we consider 1.1000 – 1.1100 a zone of resistance which may push price lower. The daily 50 period Exponential Moving Average is also present into the mentioned zone, giving it more strength, so we are dealing with strong resistance and a break would show that bulls are ready to resume the medium term uptrend. Otherwise, 1.0820 is the first destination, followed by 1.0720. The first important release of the week comes Monday in the form of the German Consumer Price Index which is the main gauge of inflation; later in the day, U.S. Manufacturing data is released, offering insights into the health of the American economy. Tuesday European inflation takes center stage as the Euro Zone CPI comes out. Wednesday the ECB will announce the interest rate and ECB President Mario Draghi will hold a press conference which is usually a huge market mover so caution is recommended if trading at the time. The same day the ADP Non-Farm Employment Change is released, offering an early look at employment in the United States. However, this report which is released by a privately owned company doesn’t have such a huge impact as the government data released 2 days later. Thursday is a slow day in terms of economic announcements but Friday the U.S. Non-Farm Employment Change (Non-Farm Payrolls) is released. This report shows how many new jobs were created during the previous month and usually has a tremendous impact on the greenback. The Pound weakened throughout last week on lower than expected British Gross Domestic Product data and the pair descended steadily into the 50 period Exponential Moving Average. Once the pair moved below the bullish trend line and below the support at 1.5500, more bears joined in and managed to take control. Currently price is testing the 50 period Exponential Moving Average on a Daily chart and this could be a major turning point for medium term price direction: a move below the EMA would open the door for a move into 1.5000 zone of support while a rejection would most likely take the pair back into 1.5500 resistance. Three Purchasing Managers’ Indexes are released throughout the first three days of the week: the first one is the Manufacturing PMI, released Monday and followed Tuesday by the Construction PMI. The last survey is the Services PMI, released Wednesday. These are all leading indicators of economic health and higher numbers are usually beneficial for the Pound. Thursday the Bank of England will announce the interest rate but no change is anticipated so the event will most likely have just a mild impact. Forex Technical Analysis: Last week’s price action was bullish on the back of an optimistic attitude shown by ECB President Mario Draghi and constructive talks regarding the Greek debt crisis. 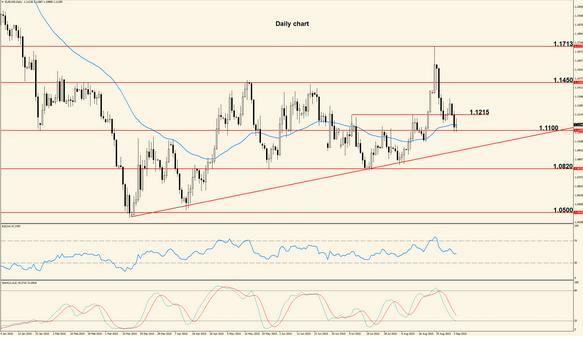 The NFP release brought US Dollar strength and took the pair lower for the end of the week. The resistance zone created between 1.1000 and 1.1100 was breached during the week and the pair approached 1.1450 with good momentum but stopped before reaching this level. The greenback strengthened on better than expected jobs data and now price returned to test the 50 period Exponential Moving Average and the level at 1.1100 which may turn into support, generating a bounce higher. 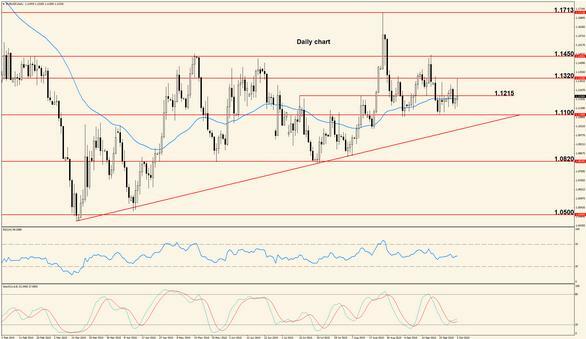 If the pair moves below these two types of support, we expect another move towards 1.0820. Economic news releases will be scarce during the week ahead but here are the most important events: Monday the Group of Seven (G7) meetings will continue (first day of the meetings is Sunday), with the Greek debt problem being one of the main topics. This can have a strong impact on the euro but the direction will depend on the outcome of the talks. It is important to note that the week may open with a gap influenced by the Sunday talks. 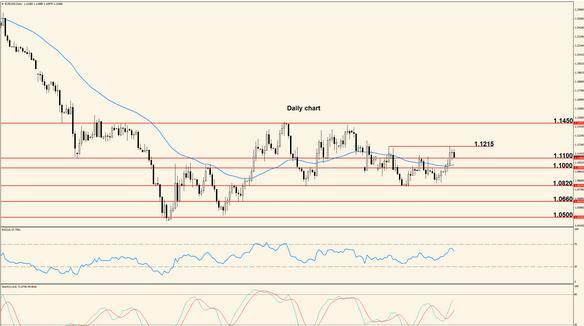 Tuesday and Wednesday are slow days for the euro and dollar so the technical side will take center stage. Thursday the greenback will be heavily affected by the U.S. Retail Sales which represent an important part of overall consumer spending, which in turn makes up for a large part of the entire economic activity. Keep an eye on the CORE version of the indicator (excludes automobile sales from calculation), released at the same time. Friday the U.S. Producer Price Index comes out, showing changes in the price charged by producers for their goods. This indicator has inflationary implications because a higher price charged by producers will be eventually passed on to the consumer. The same day, the University of Michigan will release their Consumer Sentiment survey which is a leading indicator of consumer spending. 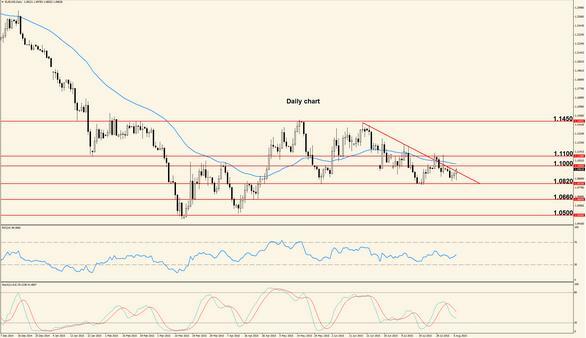 The pair moved without strong momentum last week as British economic data was mixed, generating choppy price action. The NFP release initially took the pair lower but most of the dollar gains were erased after the first impulse. The pair moved above and below the 50 period Exponential Moving Average for almost the entire week, without clear direction. The last couple of daily candles also show indecision (long upper and lower wicks) and the EMA is flat. All this makes our bias neutral for the pair until a clear move is made in either direction. The Stochastic is coming out of oversold and this is a bullish sign but as we saw on numerous occasions, this indicator can spend a lot of time in oversold or overbought territory. Representatives of the United Kingdom will attend the G7 meetings Monday so the Pound may be affected by the talks. Tuesday’s only notable British release is the Trade Balance (value difference between imported and exported goods) while Wednesday is the busiest day of the week for the Pound: the Manufacturing Production numbers are made public, an estimate of the British Gross Domestic Product is released and late in the day, Bank of England Governor Mark Carney will deliver a speech at the Annual Mansion House Dinner. No other major events are scheduled for the rest of the week. Last week the pair bounced above support but major resistance wasn’t threatened and price turned lower, affected by continued Greek debt concerns. The level located at 1.1100 offered good support but the euro couldn’t sustain a climb into 1.1450 key resistance; however the pair is still trading above a bullish trend line and above the 50 period Exponential Moving Average so the outlook is positive at the moment, anticipating another attempt to touch 1.1450. Price direction for the week ahead will be heavily influenced by the Fed’s stance regarding the next rate hike and the U.S. currency is likely to strengthen substantially if clues are offered about a September rate change. ECB President Mario Draghi will testify on monetary policy Monday, before the European Parliament. This will most likely be the day’s main event and the euro will probably react strongly, depending on Draghi’s attitude and answers. The German ZEW Economic Sentiment is Tuesday’s euro highlight, while the U.S. Building Permits will affect the US Dollar. Wednesday is the busiest day of the week for the US Dollar as the Fed will announce the interest rate and the FOMC will issue a Rate Statement, Economic Projections for the next two years and a Press Conference will follow. Fed Chair Janet Yellen will speak during the conference and will answer journalists’ questions, probably triggering sharp moves on US Dollar pairs. Thursday we will take a look at American inflation as the Consumer Price Index is released and the week ends Friday with the ECOFIN Meetings, attended by finance ministers from the European Union member states. The pair had a bullish week, breaking out of the range it was in and touching important resistance on the back of positive British economic data. 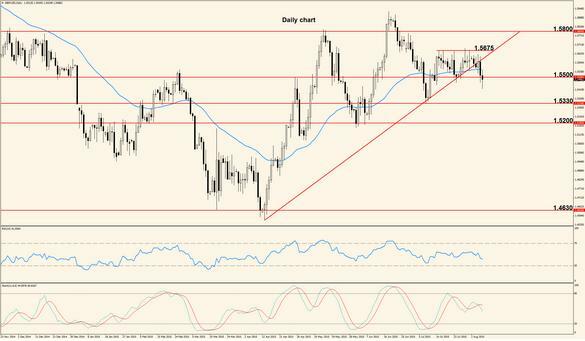 Price moved above at 1.5500 resistance, with the Stochastic being still bullish and with good support offered by the 50 period Exponential Moving Average. These factors suggest that we are dealing with a true break of 1.5500 and a potential move towards the zone around 1.5800. First confirmed support is represented by the moving average but a lot will depend on the important data released throughout the week for both the US Dollar and the Pound. The first major Pound affecting event is the release of the British Consumer Price Index which is the main gauge of inflation. The indicator comes out Tuesday and is followed Wednesday by the Claimant Count Change (change in the number of people who applied for unemployment related benefits) and by the Official Bank Rate votes which will show if there are any changes regarding the interest rate in the stance of the members of the Monetary Policy Committee. The last release of the week comes out Thursday in the form of the British Retail Sales which can strongly move the Pound because sales made at retail levels represent a hefty part of overall economic activity. As always, the U.S. events will directly affect the pair. Forex Technical Analysis: United States’ currency declined for a third week against the euro and key resistance was threatened as the Fed lower the expectations for a rate hike; however, the Eurozone is dealing with its own problems and overall the pair’s movement is choppy. The resistance at 1.1450 is an important hurdle which if surpassed will most likely bring in additional buyers. Price is trading above the 50 period Exponential Moving Average and above a bullish trend line but as long as resistance is not broken, reversals are a distinct possibility. On a daily chart price lacks momentum and candles show long wicks which is a sign of weakness and this suggests that a move south is in order if 1.1450 is not broken soon. Eurogroup and International Monetary Fund representatives including ECB President and IMF Managing Director Christine Lagarde will meet Monday in another attempt to put an end to the Greek negotiations regarding a potential default on Greek loans. The Forex market will be heavily affected by the outcome of the talks and we expect a very volatile session. Tuesday Federal Open Market Committee member Jerome Powell will speak about Fed’s decision regarding the rate hike. Hopefully he will shed some light on the timing of such a hike and if this is the case, the US Dollar will react strongly. Wednesday the currency market will be influenced by the German IFO Business Climate, a survey of about 7,000 businesses across Germany, which asks respondents to rate current economic conditions and to offer their expectations for the next 6-month expectations. The same day the Final version of the American GDP is released; although this version has the lowest impact out of the three, the release can still have a hefty influence on the greenback. The final two days of the week lack major events so probably the direction established in the beginning of the week will prevail. 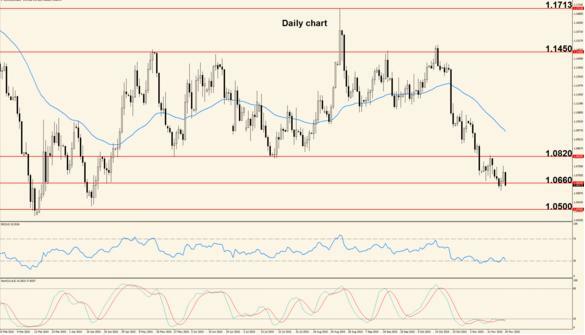 The Pound benefited from optimistic economic data last week – an increase in wages and in retail sales – so the pair climbed above 1.5800 zone of resistance. A weak Dollar had almost no answer and the entire week was bullish. Resistance is broken but the Relative Strength Index and the Stochastic both show overbought conditions, making us anticipate a move lower which will find support at 1.5800. A break of this potential support zone would imply that a deeper retracement is coming but we expect bullish price action to continue after bearish pullbacks. The Eurozone fundamental scene will have a deep impact on price action this week. The United Kingdom didn’t schedule major news releases for the week ahead and the only notable indicators are the CBI Industrial Order Expectations (Tuesday), The Mortgage Approvals (Wednesday) and a speech of Governor Carney scheduled Friday. Except for the speech the indicators are considered low-impact but surprising numbers can still move the pair. Forex Technical Analysis: Last week was characterized by extremely choppy price behavior on all but one of the trading days. The deadlock between Greece and its creditors was still not solved and now Prime Minister Tspiras is making plans for a referendum which will show the Greek people’s opinion on accepting or refusing the creditors’ demands. Price action is still governed by the Greek debt crisis as we saw last week. The pair is just moving back and forth in a tight range but this is probably going to end this week, especially because the 30th of June is the deadline for a part of the Greek debt to be paid. The 50 period Exponential Moving Average, the bullish trend line and the support at 1.1100 form a confluence zone which, if broken, will generate an extended move lower. On the other hand, a bounce here would open the door for a touch of 1.1450. The first event of the week is the release of the German Preliminary Consumer Price Index, scheduled Monday and followed Tuesday by the Eurozone Consumer Price Index. These are gauges of inflation and as we know, the ECB considers current levels too low and tries to raise them for some time now. The U.S. Consumer Confidence survey is released Tuesday as well; this is a leading indicator of consumer spending because as long as people are confident about economic conditions, they spend more. Wednesday’s main event is the release of the U.S. Manufacturing PMI which is a survey of about 400 purchasing managers from the manufacturing sector which acts as a leading indicator of economic health. The release with the highest impact of the week will be the U.S. Non-Farm Employment Change, scheduled Thursday. This is considered by far the most important jobs related data for the American economy and almost always has a huge impact on the US Dollar. Usually it is released in the first Friday of the month but this Friday the United States celebrate Independence Day so the NFP is released one day earlier. 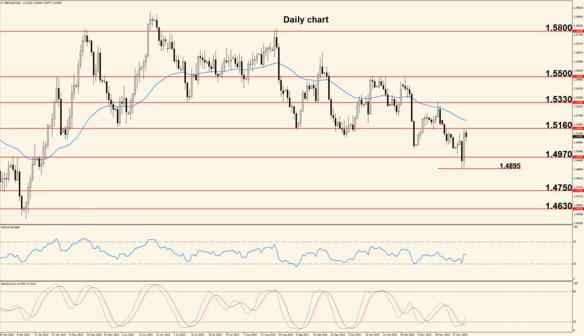 The Pound had a bearish week, retracing below 1.5800 and negating what seemed to be a clean bullish break of the mentioned level. The last few days were characterized by jerky movement, affected to some extent by the Greek deadlock. If the pair remains below 1.5800 and the level turns into resistance once again, we expect another week of bearish price action. The Stochastic has crossed downwards, coming out of overbought territory and the Relative Strength Index is also coming down after reaching overbought, increasing the chances of bearish movement. However, keep in mind that from a medium term perspective, the pair is in an uptrend. United Kingdom’s Current Account (difference in value between imported and exported goods) is released Tuesday, followed Wednesday by the Manufacturing PMI, Thursday by the Construction PMI and Friday by the Services PMI. These are leading indicators of economic health, derived from the opinions of purchasing managers from the respective sectors; the impact on the Pound differs, depending on the difference between forecast and actual numbers. As always the U.S. events will have a direct impact on the movement of the pair. Last week was characterized by irregular movement as Greece failed to meet a deadline for an International Monetary Fund loan payout and the Greek Prime Minister called for a bailout referendum that will probably affect this week’s movement. The Greek referendum will influence the week’s price action but currently our view is neutral considering the delicate geopolitical environment. If the zone between 1.1100 and 1.1000 can be broken decisively, we might experience an extended move towards 1.0820, otherwise the resistance at 1.1450 is the next target. Monday’s headline is the release of the U.S. Non-Manufacturing PMI which is a leading indicator of economic health based on the opinions of purchasing managers outside the manufacturing sector. Tuesday the U.S. Trade Balance comes out, showing the difference in value between imported and exported goods, but Wednesday will probably be the most important day of the week for the greenback as the Fed will release their Meeting Minutes. The next rate hike remains a crucial issue for the dollar trend and the Minutes can contain clues about a potential increase. The last two days of the week are slow but Friday Fed Chair Yellen will deliver a speech about economic outlook, possibly generating strong movement. Overall we had bearish price action last week and the pair managed to break the upwards trend line, approaching the 50 period Exponential Moving Average. Price is approaching 1.5500 and the 50 period Exponential Moving Average which will act as a support barrier. If this zone can be broken early during the week, the move might extend into 1.5200 but a quick move above the bullish trend line will make 1.5800 the first target. The oscillators are still bearish, increasing the chances of a move south. The British Manufacturing Production is released Tuesday and the same day an estimate of the Gross Domestic Product comes out. The accuracy of this estimated value is usually high and so is the impact on the Pound. The BOE will announce Thursday the Official Bank Rate but no change is expected from the current 0.50% so the impact will be limited unless surprises occur. Weekly Analysis: At the end of a back and forth week, filled with reversals and choppy price action, Greek Prime Minister Tsipras presented his creditors and European Leaders with a bailout proposal that could end the deadlock and unlock additional funds. The bailout proposal still has to get approval from EU Leaders and creditors (not approved at the time of writing) and the effects will most likely reverberate throughout this week’s price action. An end of this showdown may strengthen the euro and take the pair above 1.1450 but the first barrier is represented by the bullish trend line which can offer resistance if touched from below. 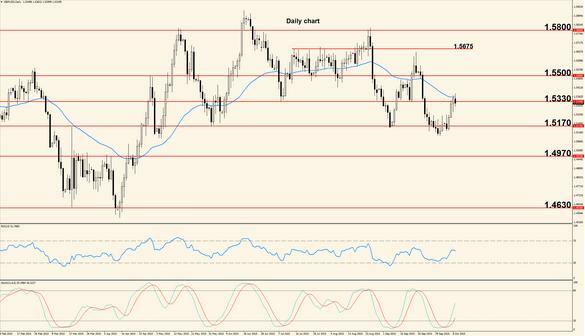 To the downside, support is located between 1.1100 – 1.1000, followed by 1.0820. Monday’s price action will be probably governed by the results of Greek negotiations and Tuesday’s main event on the euro side will be the release of the German ZEW Economic Sentiment, which is a survey derived from the opinions of about 275 analysts and professional investors regarding the 6-month outlook for German economy. The same day the U.S. Retail Sales are released, with a potentially high impact on the American Dollar considering that sales made at retail levels represent the major part of overall consumer spending. Wednesday Fed Chair Yellen will testify on monetary policy before the House Financial Services Committee and Thursday she will do the same but before the Senate Banking Committee, in Washington DC. The same day the ECB will announce the interest rate which is not expected to change but Mario Draghi’s press conference that follows will most likely create a lot of volatility. Friday the U.S. Consumer Price Index comes out, followed later in the day by the University Of Michigan Consumer Sentiment survey. 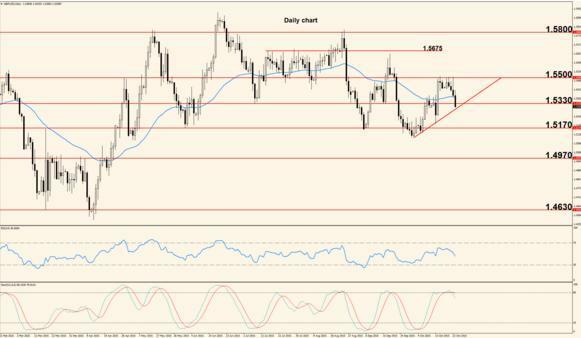 All indicators and events are considered high impact so the greenback is set for a busy week. Last week the pair remained below the bullish trend line and moved below support but most of the bearish advances were erased during the last day of the week. The latest climb can be considered a re-test of the recently broken support which could now turn into resistance. The 50 period Exponential Moving Average is also close to current price and will offer some resistance but the oscillators show bullish signs so we might see a breakout above 1.5500. If this is the case, the first resistance is located around 1.5800. The week ahead is slow in terms of economic releases, with the only notable events being the British Consumer Price Index scheduled Tuesday and the Claimant Count Change scheduled Wednesday. The first indicator measures inflation while the second tracks changes in the number of unemployed people and both are considered to have a high impact on the Pound. As always, the U.S. events will have a direct and strong impact on the pair throughout the week. Without a doubt the biggest event of the last week was the agreement on a third Greek bailout, which came after months of tension and back and forth talks. 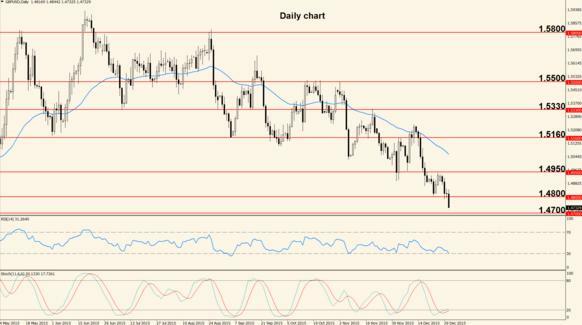 However, the euro lost its appeal to traders and the pair traveled south the entire week. The downside momentum seen last week is likely to continue throughout this week but the bears must first break the support at 1.0820. Lately the pair’s movement has been very choppy so we might see a bounce or a break but we slightly favor the south side considering that the Euro Zone is shaken by the Greek crisis and both the Stochastic and Relative Strength Index are well directed downwards without being oversold. If 1.0820 is surpassed the next target is 1.0660 while to the upside, 1.1000 is the first resistance. The week ahead is very slow in terms of macroeconomic indicator releases, with the first 2 days being almost completely quiet. Wednesday the U.S. Existing Home Sales come out, showing the annualized numbers of houses sold during the previous month (excluding new buildings). Thursday the U.S. Unemployment Claims cone out as usual, tracking changes in the number of jobless people in the United States. Friday will be the busiest day of the week as the German Manufacturing PMI is released and later in the day the U.S. Manufacturing PMI comes out. These are leading indicators of economic health based on the opinions of purchasing managers from the manufacturing sector and usually a higher number is beneficial for the currency but the impact is limited if the actual number is close to analysts’ expectations. The same day the U.S. New Home Sales are released, offering further insights into the American house market. The Pound strengthened last week when Bank of England Governor Mark Carney mentioned that a rate hike may be closer than expected but the impulse couldn’t be continued and the rest of the week lacked substantial movement. The pair is now trading above 1.5500 and above the 50 period Exponential Moving Average so the bulls have more control than the bears, making us anticipate further upside movement, possibly into the resistance at 1.5800. The candles corresponding to the last three trading days show long wicks on both sides, suggesting indecision; probably during the first days of the week we will see a strong move which will decide the direction for the week. Similar to the euro and the dollar, the pound has a slow economic week, with the busiest days being Wednesday when the Bank of England will release the breakdown of the votes on the latest interest rate and Thursday when the Retail Sales come out. A major part of the overall economic activity is represented by sales made at retail level, hence more sales suggest a thriving economy and usually strengthen the pound. As always, the U.S. events will have a direct impact on the pair’s direction. Weekly Analysis: Last week the pair bounced at 1.0820 but price action lacked momentum and the bulls didn’t manage to break first resistance. The pair is still standing below the 50 period Exponential Moving Average and below the resistance zone created between 1.1000 and 1.1100. Also, the bearish trend line seen on the chart above can provide good resistance if touched so we are dealing with a strong confluence zone which will be tough to break to the upside. If a break does occur, the next level of interest is 1.1450 and a bounce lower would make 1.0820 the first target, followed by 1.0660. The week ahead is busy, with the first important event being the release of the American Durable Goods Orders scheduled Monday. The indicator tracks changes in orders for goods with a life expectancy of more than 3 years; these goods are usually more expensive than regular ones and an increase in such orders suggests economic expansion, hence a stronger dollar. Tuesday’s main event is the release of the American Consumer Confidence survey. If confidence levels increase, spending levels might increase in the future, strengthening the US Dollar so a higher value can take the pair lower. Wednesday the Fed will announce their rate decision and will issue a statement that will offer insights into the reasons which stood behind the decision. No change is expected but hints about a late 2015 rate hike may generate strong moves. Thursday the focus remains on the US Dollar as the United States release the Advance Gross Domestic Product which is the main gauge of an economy’s overall performance. The economic week ends Friday with European inflation data in the form of the Consumer Price Index Flash Estimate. A higher value is considered beneficial for the euro and could send the pair north. The pair showed mixed price action last week, with the strongest movement being generated by a worse than expected value of the British Retail Sales which triggered Pound weakness. 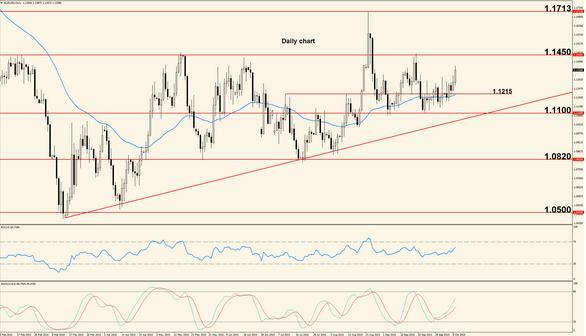 The bears are now struggling to break 1.5500 and the bullish trend line seen on the chart above. First resistance is located at 1.5765 and a break of either zone we mentioned will most likely trigger an extended move in that direction. For the moment we have a lower high on the Daily chart and the Stochastic has crossed downwards, increasing the chances of bearish moves. The British Preliminary Gross Domestic Product is the week’s only notable release on the Pound side. It’s scheduled Tuesday and a hefty increase is anticipated so we might see strong movement on the pound-dollar pair. As always, the U.S. events will have a direct impact on the pair’s behavior. WEEKLY ANALYSIS: NON-FARM PAYROLLS WEEK – US DOLLAR LOADS UP FOR A BIG JUMP? Weekly Analysis: Last week the Fed gave minor hints that we may see a rate hike this year and the U.S. Gross Domestic Product increased significantly but despite all this the pair did not have unidirectional movement and we saw sharp reversals. On a Daily chart the pair is still trading below a bearish trend line, below the 50 period Exponential Moving Average and the last daily candle shows long upper wick which is a sign of rejection. Also, the bulls tried twice last week to break 1.1100 resistance but failed. All these are bearish signs that make us believe that price will head lower this week but considering the way the pair has been moving lately, we cannot exclude another move higher. 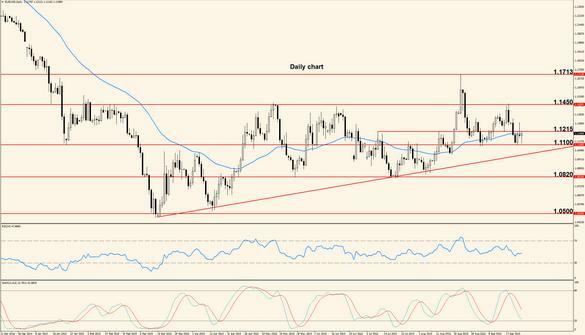 Key support sits at 1.0820 while resistance is located at 1.1100. The euro has a slow week ahead so most of the focus will be on the US Dollar. The first notable event of the week is the release of the U.S. Manufacturing PMI, scheduled Monday; it’s a leading indicator of economic health which can strengthen the greenback if it posts a higher than anticipated value. Tuesday is a calm day for both the euro and the dollar while Wednesday the U.S. Trade Balance is released, showing the difference between imported and exported goods and services. The same day Automatic Data Processing Inc. will release their version of the Non-Farm Employment change, a report which tries to mimic the Government data that comes out 2 days later. The final and most important event of the week comes Friday in the form of the Non-Farm Payrolls which is the primary gauge of employment in the United States and has a huge impact on the US Dollar. Expect strong movement at the time of the release and dollar strength if the jobs market shows signs of improvement. The pair had a very choppy week, with price climbing to resistance and then showing multiple signs of weakness and indecision. We saw a bounce at the bullish trend line, which resulted in a climb into 1.5675 resistance but the last three days have been extremely choppy, with long wicks and small bodies. The 50 period Exponential Moving Average is almost flat but still below price so it can offer support together with the bullish trend line. Our bias is neutral until we will see a clear break of either 1.5675 resistance or the bullish trend line. The first British release of the week is the Manufacturing PMI scheduled Monday, followed Tuesday by the Construction PMI and Wednesday by the Services PMI. These are all leading indicators of economic health, focused towards their respective sectors and usually have a medium impact on the Pound. The most important day of the week will be Thursday when the Bank of England will release their Inflation Report and will announce the Interest Rate decision (no change expected from the current 0.50%). Later in the day BOE Governor Mark Carney will hold a press conference discussing the Inflation Report so we are in for a day with high volatility. Friday no major UK events are scheduled but the U.S. Non-Farm Payroll will have a direct and strong impact on the pair’s movement. Weekly Analysis: Last week European news announcements were scarce and American data was mixed, creating yet another period of indecision and choppy price action. 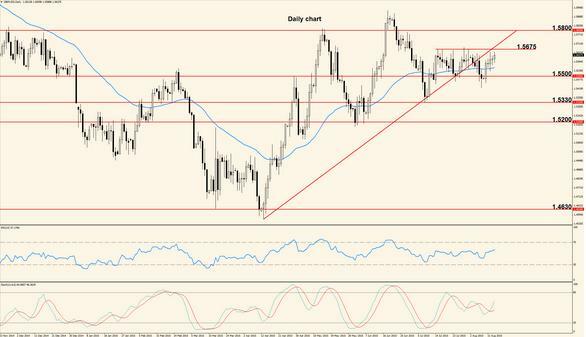 After moving to the downside in the beginning of the week, the pair reversed, without reaching the support at 1.0820. Resistance is located at 1.1000 but the next direction is uncertain, considering the way the pair has been behaving lately; the oscillators don’t show an extreme condition and are just offering mixed signals (Stochastic crossed bearish and RSI is moving upwards). There has been speculation about the Fed raising rates in September so if this week we will get further hints about this, we might see a breakout. Monday is a slow day for both the euro and the dollar and Tuesday the German ZEW Economic Sentiment survey is released, showing the opinions of 275 professional investors and analysts about the condition of the German economy. Usually this optimism indicator has a strong impact on the euro and acts as a leading indicator of economic health. Wednesday we have a calm day again but Thursday the U.S. Advance Retail Sales are released; the indicator could contribute to speculation about a rate hike if higher than expected values are posted so it could be very important for short-to-medium US Dollar strength. Friday the German Preliminary Gross Domestic Product is released, showing the performance of the German economy which is one of the most important in the European Union. The other event of the day is the release of the University of Michigan Consumer Sentiment survey; a confident consumer usually spends more so higher values are viewed as bullish for the dollar. After a slow start of the week, the pair picked up speed and finally broke out of the tight range it was in. The Bank of England did not move as close to a rate hike as some have anticipated and the Pound weakened overall. The support at 1.5500 was finally breached and last week closed with price below it. However, the last daily candle shows a long wick in its lower side, suggesting rejection so the break cannot be considered true yet, especially because lately the pair has been characterized by a lot of reversals and choppy movement. The 50 period Exponential Moving Average can offer the first resistance, followed by 1.5675 while the first support is located at 1.5330. 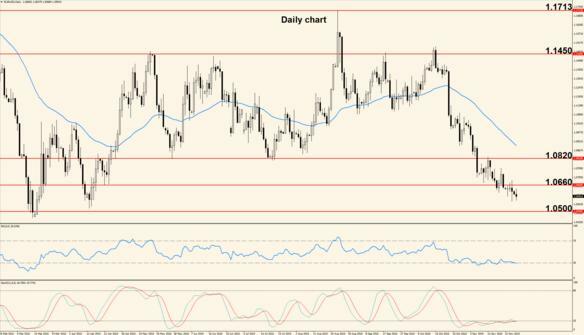 The week ahead is very slow for the Pound from a macroeconomic point of view, with the only notable indicators being released Wednesday: the Claimant Count Change and the Average Earnings Index. The first indicator tracks changes in the number of unemployed people who ask for social aid and the second indicator shows changes in the pay received by employees. A lower number of unemployed people is beneficial for the economy and a higher pay for labor is a leading indicator of consumer inflation so it can strengthen the Pound because current inflation levels are considered too low. As always, the U.S. releases will have a direct impact on the pound-dollar pair. Weekly Analysis: Last week we saw stronger movement than we’ve become accustomed to see from the pair lately. The euro strengthened on optimism regarding the Greek bailout and an end to the crisis, taking the pair above resistance. The zone of resistance created by 1.1000 and 1.1100 proved hard to break in the past and all moves outside were quickly reversed. Now price has moved once again outside the zone but it seems to have trouble breaking 1.1215 and last week we saw a bounce at this level. Once and if 1.1215 is broken to the upside, the pair is likely to move into the next resistance located at 1.1450, while a move below 1.1100 would open the door for another drop towards 1.0820. Monday no major releases are scheduled and Tuesday the only notable indicator is the U.S. Building Permits. Wednesday however, will be a very important day because we will get insights into the U.S. inflation with the release of the Consumer Price Index and also the Fed will release the Minutes of their latest meeting. This is a very important document because it usually offers hints about the next rate hike and traders around the world analyze its contents to decide the next direction. Thursday the U.S. Existing Home Sales come out, together with the Unemployment Claims and Friday focus shifts on Europe for the release of the French and German Manufacturing PMIs which are leading indicators of economic health derived from the opinions of purchasing managers from the Manufacturing sector. 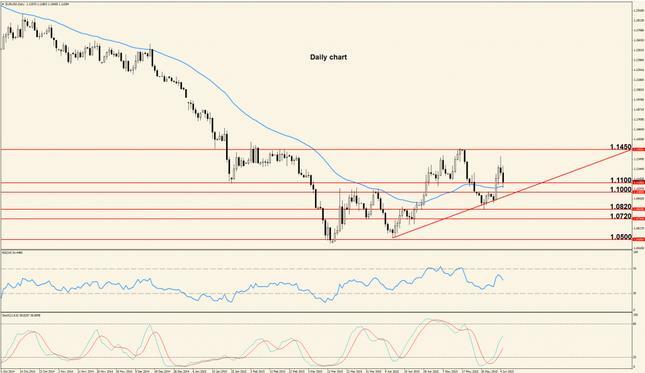 After what appeared to be a break of support, the pair rebounded early last week and the bullish impulse continued, with price approaching 1.5675, showing that the ranging period is still not over. 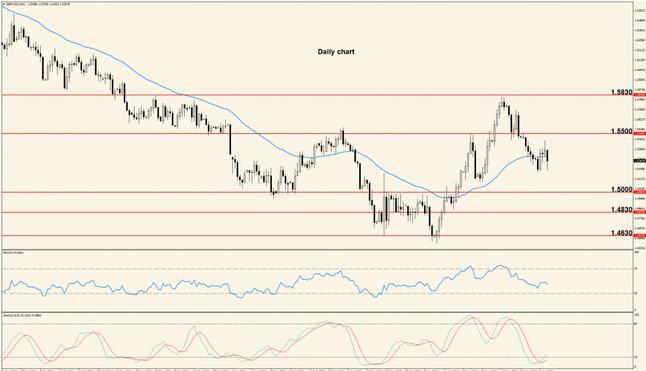 Price is still trapped between 1.5500 support and 1.5675 resistance, with daily candles showing long wicks in their upper and lower side, which is a sign of indecision. However, the pair is trading above the 50 period Exponential Moving Average and this is a bullish sign so we may see a break of 1.5675 early in the week. If this is the case, the move is likely to extend into 1.5800 resistance or at least to continue until the oscillators become overbought. A bounce at resistance would make 1.5500 the first target. Two major indicators are released this week by the United Kingdom: the Consumer Price Index (main gauge of inflation) comes out Tuesday, followed Thursday by the British Retail Sales which account for the major part of economic activity. Considering the importance of these indicators and the U.S. releases, we expect this week a move outside the range the pair has been trapped in. 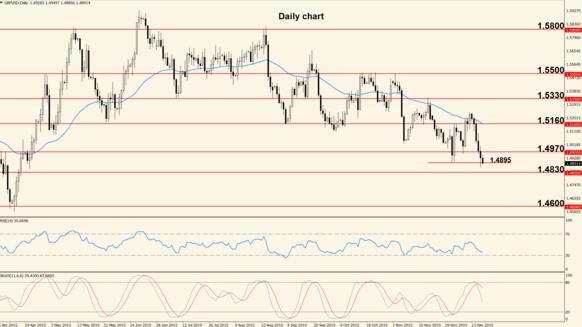 Weekly Analysis: The euro had an easy week against the US Dollar as the greenback suffered from back and forth speculation on a possible rate hike. German’s policy makers approved the third Greek bailout with overwhelming majority, contributing to euro strength. The resistance at 1.1215 was decisively broken as price moved strongly to the upside for the last three days of the last week and now the key level at 1.1450 is threatened. However, price traveled almost 350 pips without even the smallest retracement, a behavior not seen in a long while, so we expect a move to the downside that should be considered a pullback, not a reversal. This move is likely to occur once 1.1450 is touched considering that the Relative Strength Index is entering overbought but it’s still pointing upwards, suggesting that price will still move to the upside before retracing. Monday there are no special indicators scheduled for release but Tuesday things pick up with the release of the German IFO Business Climate and the U.S. Consumer Confidence. Both are leading indicators of economic optimism, the first being derived from the opinions of about 7,000 German businesses and the second is based on the outlook of about 5,000 households. Wednesday’s highlight is the release of the U.S. Durable Goods Orders (goods with a life expectancy of at least 3 years) and Thursday the U.S. Preliminary Gross Domestic Product comes out. This is the broadest measure of an economy’s performance and its importance is increased by the fact that the Fed is closely monitoring such indicators in order to time a rate hike. Friday European inflation takes center stage as the German Preliminary Consumer Price Index comes out. Inflation in the EU has been too low for quite a long period and the German economy is one of the most important for overall inflation so an increase suggests that the inflation of the entire zone could pick up. Inflation improved in the United Kingdom but Retail Sales dropped, generating mixed movement with a slightly bullish bias. The pair is still struggling to break resistance but neither side is in clear control. The daily candles show long wicks and small bodies so it’s clear that the pair is still surrounded by indecision. Although the resistance at 1.5675 has been breached several times last week, we still haven’t seen a strong candle that closed above it so a move south still has a high probability of occurring. The Stochastic has reached overbought and is curving downwards, increasing the chances of a drop; if this happens, the 50 period Exponential Moving Average will be the first target, otherwise the pair is likely to move into 1.5800. The Pound has a slow week ahead as the United Kingdom didn’t schedule major news releases except the Second Estimate Gross Domestic Product which comes out Friday. This is the main gauge of overall economic performance and it’s the second version out of the three (Preliminary, Second Estimate and Final). Weekly Analysis: The week that just ended showed a sharp reversal after establishing a multi-month high at 1.1713. The pair came down as hard as it climbed, influenced by turmoil on the Chinese markets and speculation about how they will affect a potential Fed rate hike. Two important levels were breached to the downside: 1.1450 and 1.1215 and although these provided good resistance in the past, they did not turn into support and didn’t manage to push price higher once touched. Now the bears are in control and it is less likely to see another sharp turn to the upside, the oscillators show good momentum and are moving down coming from overbought so we anticipate a move into the bullish trend line seen on the Daily chart above. The fundamental data will play a major role in this week’s price action. Monday we will receive more information about European inflation as the Flash Estimate Consumer Price Index is released. Tuesday US Manufacturing data comes out in the form of the Purchasing Managers’ Index and Wednesday we take a first look at US jobs data as Automatic Data Processing Inc. will release their version of the US Non-Farm Employment Change report. The “heavy” events start Thursday when the European Central Bank announce their rate decision and ECB President Mario Draghi holds a press conference during which he answers journalists’ questions. The conference creates strong movement almost always so caution is recommended while the ECB President speaks. The economic week ends Friday with the most important jobs report for the US economy: the Non-Farm Payrolls (also known as Non-Farm Employment Change). The indicator shows how many new jobs were created during the previous month and has a strong impact on the US currency because more jobs lead to increased levels of consumer spending, which represents a major part of overall economic activity. 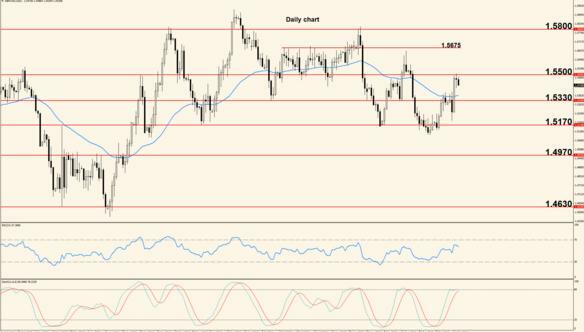 After a bullish first day of last week, the pair dropped substantially and traveled roughly 500 pips to the downside, reaching 1.5330 support and generating a massive win for the bears. The pair showed an almost perfect bounce at 1.5800 resistance and the bears took over, creating the biggest movement seen during the last period. Price was trapped between 1.5675 and 1.5500 and now that it has broken out, we expect the current direction to continue during the weeks to come. The first barrier in front of falling prices is the key support at 1.5330 where we expect price to stall or rebound slightly higher and continue lower afterwards. The oscillators show good downside momentum but the RSI is approaching oversold, increasing the chances of a pullback during the week. Monday British banks will be closed in observance of Summer Bank Holiday, thus no major indicators are released and liquidity might be irregular. Tuesday the British Manufacturing PMI is released, followed Wednesday by the Construction PMI and Thursday by the Services PMI. These are all surveys of purchasing managers and act as leading indicators of economic health so numbers that surpass analysts’ expectations are beneficial for the Pound. As always, the US events will have a direct and strong impact on the pair. Weekly Analysis: The week that ended was characterized by bearish price action as ECB President Mario Draghi had a dovish stance on economic growth and inflation expectations. U.S. employment data was mixed, showing that fewer new jobs were created but the Unemployment Rate dropped, bringing some strength to the dollar. The pair moved below the 50 days Exponential Moving Average but the support at 1.1100 stopped the fall, at least for the moment. This week we expect a break of the mentioned support and a move into the uptrend line seen on the chart above. If the trend line is indeed touched, the oscillators are likely to become oversold and this may create a bounce higher, with the moving average becoming the first potential resistance. If current support rejects price, 1.1215 will become first potential target. Monday U.S. banks are closed due to Labor Day so there are no major indicators scheduled and the pair may suffer from irregular volatility. Tuesday the headline is the release of the Euro-Zone Gross Domestic Product and Wednesday is a slow day, without notable events. Thursday the US Unemployment Claims come out, showing how many people applied for unemployment related benefits and Friday we will get more information about European inflation as the German Consumer Price Index is released. Also, on the dollar side, the University of Michigan will release their Consumer Confidence survey which shows how respondents rate the current and future economic conditions. British economic data disappointed throughout last week and this was reflected in a weak Pound and a massive drop for the pair, without the smallest pullback. Two important support levels were broken last week (1.5330 and 1.5200) and it seems like a new medium term downtrend is beginning to shape up. The Relative Strength Index and the Stochastic are both oversold and this fact, combined with the lack of a proper pullback, makes us believe that this week we may see bullish price action. It is important to note that all moves up should be treated as pullbacks in a downtrend. Wednesday is the first important day of the week for the Pound as Manufacturing Production numbers come out, followed later in the day by the NIESR estimate of the British Gross Domestic Product. Thursday the Bank of England will announce the interest rate decision and the structure of the members’ votes. Analysts don’t expect a rate change but if more members of the committee voted for a hike, the Pound is likely to strengthen because this could mean that a rate liftoff is getting nearer. As always, the U.S. indicators released throughout the week will have a direct impact on the pair. Weekly Analysis: Last week price action was mostly bullish, on the back of a lackluster fundamental scene and US Dollar weakness, which generated a move above immediate resistance. Volatility increased in the second part of the week, mostly influenced by economic releases. The pair is now trading above the 50 day Exponential Moving Average and above 1.1215 so the next logical destination is the important level at 1.1450. Both the Stochastic and the Relative Strength Index are moving upwards, supporting a continued move to the upside, at least until they approach extreme levels (overbought). A touch of resistance combined with a potentially overbought state of the oscillators may generate a move lower but the week’s direction will be heavily influenced by the huge Fed event. Ahead of the major Fed rate decision, the markets will be influenced Tuesday by the German ZEW Economic Sentiment which is a survey of about 275 investors and professional analysts focused on their opinion regarding the 6-month economic outlook. The same day the U.S. Retail Sales are released so we have a busy day, with possibly strong movement. Wednesday we take a look at American inflation as the U.S. Consumer Price Index is released and Thursday we will witness probably the most anticipated event of the year so far: the Federal Funds Rate decision. Since the beginning of the year, speculation has surrounded a potential U.S. rate hike and the most talked about date for such a change is finally here. An increase is anticipated, but even if it doesn’t occur, the US Dollar will move strongly at the time of the release, which will be accompanied by a Press Conference and a Rate Statement. It is likely to see irregular movement during the days preceding the Fed meeting so caution is recommended throughout the week. For almost the entire last week the Pound strengthened against the greenback and we saw a bullish pullback which is now close to resistance. The pair is now approaching a heavy resistance zone represented by the 50 days Exponential Moving Average and the level at 1.5500. Both oscillators are still bullish but before the current up move, the bears showed great strength which may come back once 1.5500 resistance is touched. If this is true, 1.5330 will become the first target but keep in mind that the importance of the Fed rate decision will overshadow any technical scenario. Apart from the Fed decision, the pair will be influenced by the British inflation numbers which come out Tuesday in the form of the Consumer Price Index, by the British Claimant Count (change in the number of people who applied for unemployment related help) released Wednesday and by the British Retail Sales scheduled for release Thursday. We expect a busy week, but it’s possible to see choppy price action until the Fed meetings. Weekly Analysis: Last week the US Dollar was heavily influenced by the Fed rate meeting and by speculation regarding the outcome. As we know the Fed decided to maintain the rate unchanged but Fed Chair Yellen mentioned they are closer to a hike, which could come as soon as October. 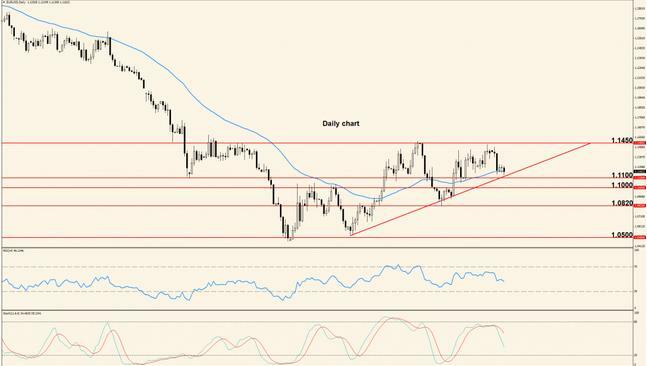 The rate decision initially weakened the dollar but probably hopes of an October hike, staged a comeback and the pair bounced at 1.1450 resistance. The first support is located at 1.1215 which combined with the 50 day Exponential Moving Average will create a confluence zone which will be tough to break. If this zone is breached, we expect price to head into the bullish trend line visible on the chart, otherwise we will see another encounter with 1.1450. The week ahead is rather calm when it comes to economic releases but here are the most notable events: Monday the greenback will be affected by the Existing Home Sales numbers and Wednesday ECB President Mario Draghi will testify on monetary policy before the European Parliament. Thursday the German IFO Business Climate survey comes out, alongside the US Durable Goods Orders (goods with a life expectancy of at least 3 years). The week ends Friday with the Final version of the American Gross Domestic Product; although this is the least important out of the three versions (Advance, Preliminary and Final), it must not be overlooked as it can generate US Dollar strength if it posts a higher than expected value. Even before the Fed event, the Pound started to strengthen against the greenback, mostly because of hints that the Bank of England is preparing a rate hike in the near future. The week was overall bullish but some gains were erased Friday. Last week’s climb took price above the 50 day Exponential Moving Average, in close vicinity to 1.5675 resistance but candles corresponding to the last 2 days show long wicks in their upper parts. This is a sign of rejection, which combined with the importance of 1.5675 resistance for short term movement, makes us believe that we will see a move towards 1.5330 this week. A bounce at 1.5500 would suggest that bullish movement will continue and that 1.5675 will probably be broken. The week is very slow for the Pound, with the only noteworthy indicator being the Public Sector Net Borrowing numbers released Tuesday. The indicator shows the difference between spending and income for the government and public corporations, with a higher number being considered detrimental because it shows more debt. Usually the impact of this release is mild, unless there’s a big difference between expectations and actual numbers. Weekly's Analysis: The first 2 days of last week were bearish, with the pair heading towards the support at 1.1100 but once this barrier was hit, price action became mixed and neither side managed to post further advances. The pair is now trapped between 1.1215 resistance and 1.1100 support and overall movement is choppy. We maintain a slightly bearish bias, anticipating a break of 1.1100 and a touch of the bullish trend line. If the trend line is broken, the pair is “free” to travel lower, with 1.0820 as the first major target. To the upside 1.1450 remains key resistance. The first important event of the week comes Monday in the form of an interview of FOMC voting member William Dudley who will discuss inflation expectations and interest rate increase. This interview is of direct interest to Forex market participants and could spur strong US Dollar movement. Tuesday a United States Consumer Confidence survey is released and will act as a leading indicator of consumer spending, while on the Euro side we will take a first look at German inflation as their Preliminary Consumer Price Index comes out. Wednesday the European Consumer Price Index Flash Estimate comes out, offering insights into overall Euro Zone inflation and Automatic Data Processing Inc. will release their version of the Non-Farm Employment Change which will affect the greenback but to a lower extend than the government jobs data released 2 days later. Thursday is a quiet day, with the most important release being the US Manufacturing PMI (survey or purchasing managers regarding economic conditions in the manufacturing sector) and Friday will probably be the most volatile day of the week as the U.S. Non-Farm Payrolls are released. This is widely considered the most important jobs related report for the United States and the impact on the US Dollar is almost always huge, with more jobs strengthening it and the opposite for less jobs. 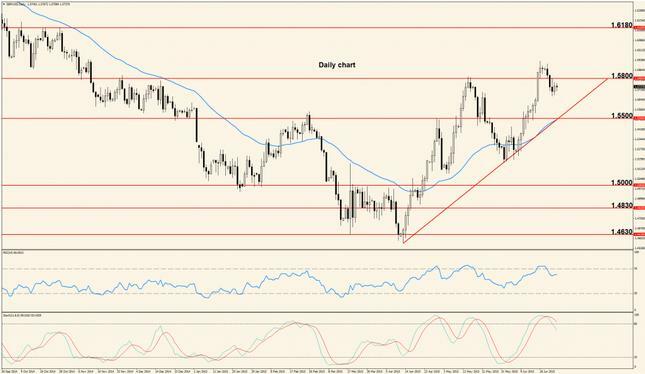 The pair dropped 5 days out of 5 last week and the bears managed to break important support levels as the dollar strengthened and the pound was affected by weak economic data. Short term price action is controlled by the bears but the pair is printing a triple bottom pattern around 1.5170. This is a bullish pattern which is likely to generate upside movement and if this is the case, we may see a touch from below of 1.5330. A break of 1.5170 zone and thus an invalidation of the triple bottom will open the door for a move towards the next level of interest, which is located around 1.4970; the oscillators are still bearish, supporting such a move. Tuesday Bank of England Governor Mark Carney will deliver a speech at the Lloyds of London but the late hour (7:40 pm GMT) may hinder a high impact unless the Governor makes intriguing or strong remarks. Wednesday the British Current Account (difference in value between imported and exported goods and services) is made public and the same day the Final Dross Domestic Product is also released. Thursday we get insights into the health of the British manufacturing sector with the release of the Manufacturing Purchasing Managers’ Index and Friday the only notable event for the Pound is the release of the Construction PMI. Of course, the U.S. Non-Farm Payrolls will have a strong impact on the pair as always. Weekly Analysis: The week was mixed ahead of the American jobs data as most market participants waited to see the result. The pair rallied strongly on the back of US Dollar weakness generated by the disappointing numbers but the euro soon gave back most of the gains. The climb was stopped by the resistance level located at 1.1320 and price moved again below 1.1215, so a breakout didn’t occur despite important economic data. First support is located at 1.1100 but the pair is still in indecision mode and it will remain so until either 1.1320 or 1.1100 are broken. The 50 period Exponential Moving Average is flat and doesn’t offer any kind of support or resistance for the time being but keep in mind that U.S. data was much worse than expected so we are likely to see dollar weakness. The week is slower than the last in terms of economic releases but here are the main events: Monday the US Dollar will be affected by the Non-Manufacturing PMI and Tuesday the U.S. Trade Balance (difference between the value of imported and exported goods and services) comes out. Both are important indicators but the impact often depends on the difference between forecast and actual (a bigger difference will generate stronger impact). Also Tuesday, ECB President Mario Draghi will deliver a speech in Frankfurt so the euro is likely to show increased volatility. Wednesday is a slow day, without notable events but Thursday the always important FOMC Meeting Minutes are released, offering insights into the Fed’s latest meeting. Many analysts’ expected a rate increase which didn’t occur so maybe some questions regarding the reasoning behind this decision will be answered in the Minutes. That release will be the last major event of the week because Friday no major indicators are scheduled. The week ended almost where it started, with the main event being the U.S. NFP which generated a strong climb followed by a smaller drop. The support at 1.5100 was nearly touched last week and price bounced higher but the bulls couldn’t close above 1.5200 despite the blow took by the US Dollar from disappointing jobs data. This shows that the Pound still lacks the strength needed to stage a move higher but if early in the week, the pair moves above 1.5200, we may see an attempt to travel towards 1.5330, otherwise 1.5100 is likely the next destination. The economic week opens for the Pound Monday with the release of the Services PMI, a survey of purchasing managers regarding the health of the services sector, followed Wednesday by the Manufacturing Production numbers (shows changes in the total value of output generated by the manufacturing sector). The last major release of the week for the Pound is the BOE Interest Rate scheduled Thursday. The current value is 0.50% and no change is expected but at the same time a breakdown of the MPC members’ votes is made public and this can have an impact on the Pound if some members have changed their vote compared to the previous release. Weekly's Analysis: Last week the pair picked up speed and moved to the upside with more determination on the back of soft economic data coming out of the United States. The Fed didn’t offer clear clues that a hike is due this year, contributing to a weak US Dollar. The resistance at 1.1215 was clearly broken and the bulls are making a run for 1.1450. Both oscillators are moving upwards, without being overbought so the chances of an encounter with the key resistance at 1.1450 are higher now than they’ve been before but keep in mind we are still in a raging market, without clear direction. 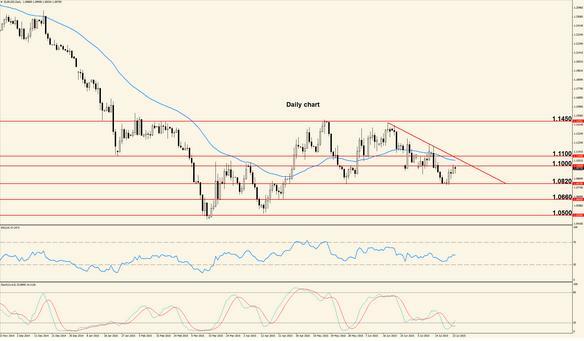 A break of 1.1450 would bring in additional buyers and would mark a possible end to the ranging market. To the downside, the pair is supported by a bullish trend line, the 50 period Exponential moving Average and 1.1215. Monday U.S. banks are closed, celebrating Columbus Day and Europe didn’t schedule major announcements so we expect a slow grinding day. Tuesday the German ZEW Economic Sentiment survey comes out, showing the opinions of about 275 German professional investors and analysts about a 6-month economic outlook. 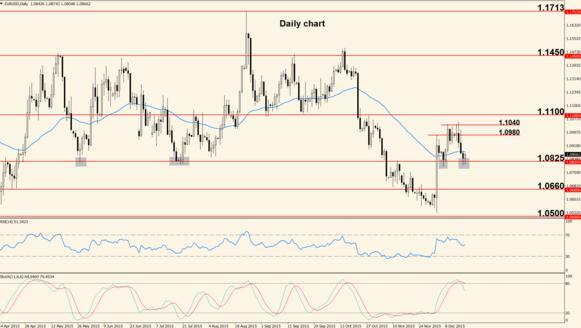 Wednesday action picks up as the United States Retail Sales numbers come out but things on the European side are slow. Thursday the U.S. Consumer Price Index is released and the impact on the market is likely to be strong especially because the Fed takes inflation into consideration when deciding whether to raise rates or not. Later in the day the Philly Fed Manufacturing PMI comes out, offering insights into the health of the manufacturing sector in the Philadelphia district. The week ends Friday with the release of the European Final CPI, which has a medium impact on the market, mainly because the German Prelim CPI and CPI Flash Estimate are already released. Later in the day the University of Michigan will release a Consumer Sentiment survey which is important for the US Dollar because increased levels of confidence among consumers suggest that an increase in retail sales will soon follow. The Pound had a bullish week, mostly because its counterpart, the dollar, suffered from mixed sentiment and signals from the Fed. Although the pair made substantial advances last week, important resistance sits in front of further upside movement: price bounced Thursday and Friday at the 50 days Exponential Moving Average and 1.5330 horizontal resistance is not clearly broken. If this confluence zone can be broken during the first days of the week, we are likely to see a move close to 1.5500 but otherwise the zone around 1.5170 – 1.5200 is the next target. The main events for the Pound are the release of the British Consumer Price Index (main gauge of inflation) scheduled Tuesday and the Claimant Count Change which comes out Wednesday The second indicator shows how many people applied for unemployment related help and a higher number is detrimental for the economy because people without jobs spend less, thus a slowdown of consumer spending is likely to follow. Weekly Analysis: Last week the economic data was mixed and we witnessed an important event for medium term movement: a false break of key resistance (1.1450). This is likely to influence future price action and can be considered a major turning point. Although recent movement was choppy, the pair had a bullish bias but a lot of bearish pressure was also present. Now it’s time to see if the bulls really have what it takes to establish clear control and they could do this only if 1.1450 is broken early in the week. The last 2 days of the previous week belonged to the bears and the fact that 1.1450 rejected price is a clear sign of bull weakness but the beginning of a medium term downtrend must be confirmed by a break of the bullish trend line seen on the daily chart above (the moving average and 1.1215 support are also important for this scenario). The first notable event of the week is the release of the U.S. Building Permits, scheduled Tuesday. The indicator shows the annualized number of permits issued for the beginning of residential building during the previous month. A higher value is usually beneficial for the greenback because it shows increased construction activity but the impact is often mild. Wednesday the calendar is light and Thursday the most anticipated event of the week takes place: the ECB announces the interest rate and ECB President Mario Draghi holds a press conference, discussing the rate decision. Journalists ask questions and this is usually the most important part of the day, with strong moves for the euro. The economic week ends Friday with the release of the German and French Manufacturing PMIs; both are leading indicators of economic health derived from the opinions of purchasing managers from the manufacturing sector and higher numbers bring euro strength. The Pound showed great strength last week and pushed the pair into 1.5500 resistance although the British economy is not at its best. U.S. data was also pretty weak, contributing to the pair’s climb. 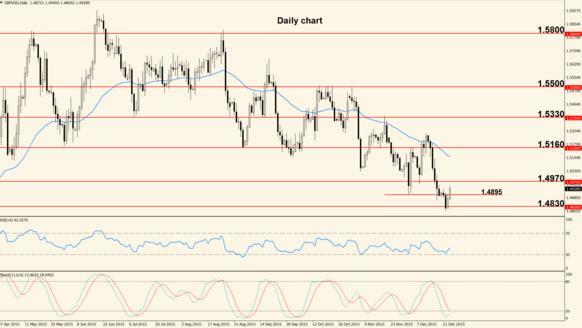 After touching 1.5500 resistance, the pair paused for two days and retraced slightly lower. This could be a sign of buyer weakness but could also be just a consolidation generated by traders closing their positions at this important level. If the latter is true, we will probably see a move towards 1.5675 this week but keep in mind that the daily Stochastic is touching its overbought level; this is not an extreme condition but further climbs can be slowed down, especially if the Relative Strength Index will enter overbought too. Only two important events will affect the Pound this week: Tuesday, Bank of England Governor Mark Carney will testify before the Treasury Select Committee about the BOE Bill and Thursday the British Retail Sales numbers are announced. Both events can bring increased volatility so caution is recommended. Weekly Analysis: Last week price movement was very slow before the speech of the ECB President Mario Draghi but his comments about more stimulus and even a possible decrease of the deposit rate triggered euro weakness and brought the pair out of the small range. An important bullish trend line was broken last week, together with the 50 period Exponential Moving Average and the horizontal support at 1.1100. This puts the sellers in clear control and prepares us for a medium term bearish market but does not exclude a bullish pullback. Price is likely to stall around 1.1000 before continuing towards 1.0820 which is key support for medium term price action; first resistance is located at 1.1100. The first event of the week is the release Monday of the German IFO Business Climate which is a survey with a large sample of about 7,000 businesses. Tuesday the focus shifts on the U.S. economy for the release of the Durable Goods Orders and the CB Consumer Confidence survey. Lately the impact of these indicators has been lower than usual but strong movement is still a distinct possibility. Wednesday the Fed will announce their decision on the interest rate and a FOMC Rate Statement will be released, showing the reasons behind the decision. Unlike in September, a rate hike is not expected (currently <0.25%) but caution is recommended throughout the day. The German Preliminary Consumer Price Index is scheduled Thursday; because it’s an important gauge of inflation, higher numbers can positively affect the euro. The same day the US Dollar will be heavily influenced by the U.S. Advance Gross Domestic Product. The week ends Friday with the release of the German Retail Sales and Eurozone Consumer Price Index; both can have a big impact if the actual numbers differ substantially from the analysts’ forecast. Despite strong British Retail Sales numbers, the Pound lost ground against the US Dollar last week, after another attempt to break 1.5500 resistance. The week was clearly bearish and it offered important clues about future direction. The resistance at 1.5500 generated a heavy bounce lower and by doing so, it also showed the importance of this level for future price action. The pair is still trading above the bullish trend line seen on the chart but the level at 1.5330 has been breached and the momentum is bearish so we expect a move below this diagonal support. If this scenario comes true, the next area of interest is 1.5200 – 1.5170 but on the other hand, a bounce at the trend line will probably generate another encounter with 1.5500. Only one major event will influence the Pound this week: the British Preliminary Gross Domestic Product. This is the main gauge of an economy’s overall performance and the Preliminary version is the most important out of the three (Preliminary, Second Estimate and Final). The release is scheduled Tuesday and higher values normally strengthen the Pound; of course, the U.S. events will have a direct impact on the pair, as always. 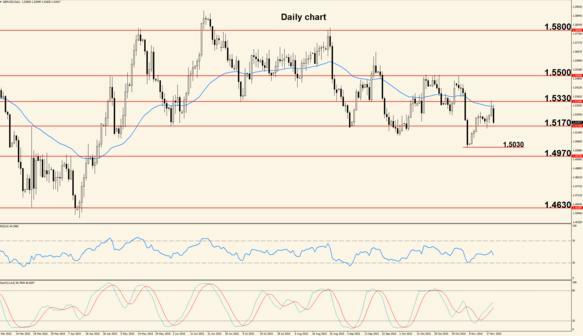 Weekly Analysis: Last week the US Dollar strengthened on speculation that a December rate hike is still on the table but most of the gains were erased Friday and the pair moved above resistance. The first important release of the week is the U.S. Manufacturing PMI which is scheduled Monday and acts as a leading indicator of economic health with focus on the manufacturing sector. Tuesday ECB President Mario Draghi will speak in Frankfurt and Wednesday we take a first look at U.S. employment with the release of the ADP Non-Farm Employment Change. The same day Fed Chair Janet Yellen will testify on bank regulation before the House Financial Services Committee. The last and probably most important event of the week is the release of the U.S. Non-Farm Payrolls, scheduled Friday. This is always a huge market mover but more so now, because at their latest meeting the Fed mentioned that a rate hike is tightly correlated with jobs and inflation. Look for strong movement and use caution at the time of the release. 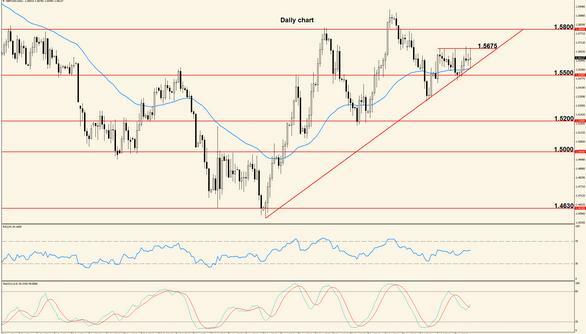 The Pound showed surprising strength during the last trading day of last week and managed to reverse the previous bearish momentum, moving the pair above several resistance areas. Although the pair broke a bullish trend line early last week, the downside momentum proved short lived and price returned above the trend line as well as above 1.5330 and the 50 period Exponential Moving Average. This makes 1.5500 the first destination but recently we saw this level reject price several times so it will provide strong resistance once touched. We expect a bearish bounce at the mentioned level but on the other hand, a break would show the bulls have enough strength to retake overall control. The week ahead is busier for the Pound than usual: Monday, Tuesday and Wednesday the Manufacturing PMI, Construction PMI and Services PMI come out respectively, but the most important day is Thursday when the BOE will announce their decision on the interest rate. A monetary Policy Summary is released at the same time, together with a breakdown of the votes and the Inflation Report which will offer BOE’s projections on inflation and economic growth for the next 2 years. Soon after, BOE Governor Mark Carney will hold a press conference, discussing the Inflation Report. Friday morning the British Manufacturing Production numbers come out and later in the day, NIESR will release a British GDP Estimate. As always, the U.S. announcements made throughout the week (especially the NFP) will have a direct impact on the pair. Weekly Analysis: For the entire last week the bears maintained their control over the pair, capitalizing on a much better than expected NFP value. The probability of the Fed raising rates in December has increased substantially and this will probably contribute to further downside movement. The support at 1.0820 was broken last week and this represents a major turning point for medium term direction. The next destination is most likely 1.0500 but before it can be reached, price needs to retrace higher in order to clear the oversold condition of the oscillators and possibly to re-test 1.0820 from below, confirming it as resistance. The overall bias is negative so expect continued downside movement, with 1.0660 as minor support. The first two days of the week are relatively light in terms of news announcements, with the only important events being the Eurogroup Meetings (Monday) and the ECOFIN Meetings (Tuesday). Wednesday U.S. banks will be closed in observance of Veterans Day so it’s possible to see irregular volatility during the New York session. The same day, at ECB President Mario Draghi will speak at the Bank of England Open Forum; caution is recommended because his speeches always have the potential to strongly impact the single currency. Thursday is again a slow day but Friday the action picks up with the release of the German Preliminary Gross Domestic Product, the U.S. Retail Sales and the University of Michigan Consumer Sentiment survey. All three are considered high-impact releases so the pair’s direction will probably be heavily influenced by the results. The pair suffered last week from a disappointing Inflation Report as the BOE lowered their economic growth and inflation expectations. 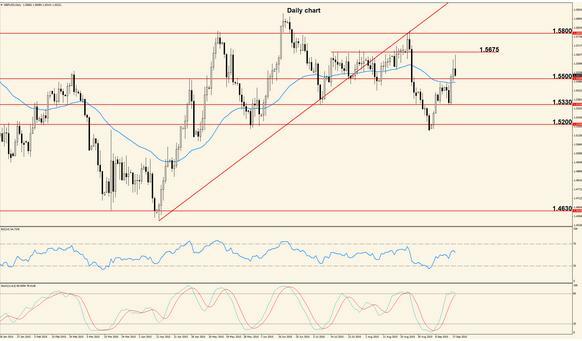 The NFP release strengthened the greenback so the pair finished the week considerably lower. We expect the downside price action to continue now that the zone around 1.5170 – 1.5200 is broken and the balance is clearly tilted in favor of the bears. However, such a drop is usually followed by a counter move, thus early during this week we anticipate a move higher, which should be treated like a retracement, not a reversal. The oscillators are not oversold but the pair has traveled a long distance in a short while, which makes a move up more probable. The most important event of the week for the Pound is the release of the Claimant Count Change scheduled Wednesday. The indicator tracks changes in the number of total people who applied for unemployment related aid and usually affects the Pound strongly, with higher numbers being detrimental. The same day BOE Governor Mark Carney will hold a press conference with the main topic being the Inflation Report. This is another possible reason for high volatility so caution is recommended. The rest of the week lacks major economic announcements for the Pound. Two very important announcements will affect the Pound this week: Tuesday the British Consumer Price Index is released, offering a status of inflation in the United Kingdom and Thursday the Retail Sales come out. Considering that sales made at retail levels account for a major part of overall economic activity, higher numbers usually strengthen the Pound. Throughout the week the pair will be affected by the U.S.
WEEKLY ANALYSIS: HOW WILL CHRISTMAS WEEK AFFECT THE US DOLLAR? Weekly Analysis: Last week the most anticipated Fed meeting of the year took place and we witnessed a rate hike to <0.50% from the previous <0.25%. The change did not have the immediate effect which most market participants expected but US Dollar strength is probably going to extend to the near future. Price action throughout the week will be affected by the Christmas Holidays and we are likely to get irregular movement so we recommend caution throughout the week. The pair is currently testing the support zone created around 1.0825 and we expect small bounces to the upside before the level can be broken. However, note the position of the Daily stochastic which is just exiting overbought, a fact which favors extended moves to the downside; Fed’s decision to raise the rate will probably contribute to a stronger move south as well. The week ahead will be influenced by Christmas and economic news are scarce. Monday no major events are scheduled and Tuesday the Final version of the U.S. Gross Domestic Product comes out, alongside the Existing Home Sales. Wednesday we have the U.S. Durable Goods Orders and the New Home Sales, while Thursday is Christmas Eve and the only notable indicator is the U.S. Unemployment Claims. However, the effect of this release is hard to anticipate due to the low liquidity which will most likely be present. Friday is Christmas Day thus most banks and brokerages all over the world will be closed so price action will be irregular and without clear direction. The US Dollar performed better against the Pound than it did against the Euro and we saw strong movement south despite better than anticipated economic data released by the United Kingdom last week. The bears are having difficulties breaking the support zone around 1.4895 but we expect this barrier to fall and price to head into 1.4600. However, this distance is not likely to be traveled this week. The first target after a potential break of 1.4895 will become 1.4830 (better seen as support on a Weekly chart), but as mentioned earlier, price action during the entire week will be affected by the Christmas Holidays, thus we recommend extra caution. The British Current Account is released Wednesday, showing the difference between the value of imported and exported goods. A higher than expected number is beneficial for the Pound but the effect is often mild and probably more so this time because we are getting close to Christmas. The same day, United Kingdom’s Final Gross Domestic Product is released; this is the main gauge of overall economic performance but the Final version usually has the lowest impact. Friday British Banks will be closed, celebrating Christmas Day. Weekly Analysis: Last week was bullish overall but price movement was affected by Christmas Eve and Christmas Day when most banks were closed. Prior to that, resistance was touched but not broken. The pair touched 1.0980 resistance but failed to break it and this was mostly because liquidity was thin during the past week. However, the bounce lower at resistance also shows that the bulls lack the strength needed to continue the latest impulse and makes us believe that a move lower is next. The first target for this potential move down is located at 1.0825, followed by 1.0800 but New Year’s Eve and New Year’s Day will play a big role by slowing down the market and creating low liquidity. We expect price to remain inside the range created by 1.1040 and 1.0825. The week ahead will be still affected by the low liquidity and irregular movement characteristic for the Winter Holidays, but here are the main things to keep an eye on: Tuesday a U.S. Consumer Confidence survey is released, showing the opinions of about 5,000 households regarding overall economic conditions and Wednesday the Pending Home Sales come out, giving us insights into the U.S. housing market. Thursday German Banks will be closed in observance of New Year’s Eve and on the US Dollar side the only notable indicator is the Unemployment Claims but usually this release does not create strong impact. Friday most banks across the globe will be closed, celebrating New Year’s Day so the market will be practically still, with almost no movement. 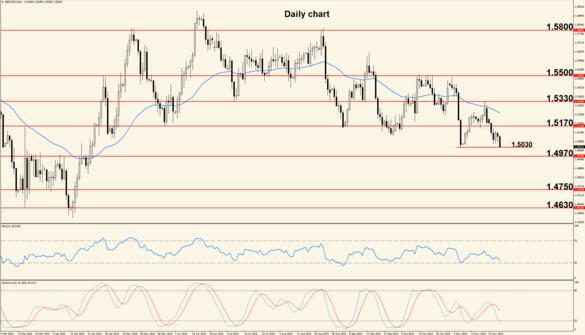 The US Dollar continued to strengthen against the Pound early last week but the gains were erased in the second part of the period and the pair ended up almost where it started. The bounce at 1.4830 support suggests that the reign of the bears is coming to an end and that we are likely to see an extended retracement to the upside. If this comes true, the first minor resistance is located at 1.4970, followed by the psychological resistance at 1.5000. 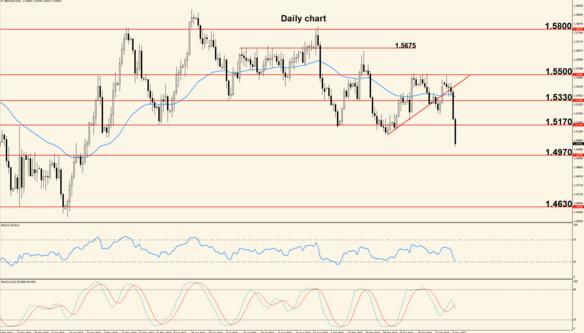 The level at 1.4895 is in close vicinity but its role is not clear; the Stochastic is curving upwards, coming from oversold and thus supporting a bullish move. The Relative Strength Index is bouncing on its 70 level, showing some bullish divergence, and this further favors a move north but the passing of the year will surely affect price action. The United Kingdom didn’t schedule any major releases for the week ahead and on top of that, Monday and Friday UK banks are closed, celebrating Boxing Day and New Year’s Day respectively. Throughout the entire week ahead we expect slow, choppy and potentially irregular movement but this is a well-known characteristic of the last week of the year. Weekly Analysis: Last week the pair bounced at resistance and traveled lower on the back of thin volatility. Overall, price movement was affected by the changing of the year so the real market direction will be probably revealed this week. The bounce at 1.0980 shows that the bulls are starting to fade away and the bears are taking over. For that to happen, the support zone between 1.0825 – 1.0800 must be broken and re-tested from below (support must turn into resistance). If this is the case, then we will probably see a move into the zone around 1.0660 once normal liquidity is restored. A rejection at 1.0825 – 1.0800 would suggest that price is headed for 1.0980 – 1.1000 zone once again. The week starts Monday with the release of the German Preliminary CPI which as we know is the main gauge of inflation and later in the day the U.S. Manufacturing PMI comes out. This is a survey of purchasing managers regarding the health of the manufacturing sector and can bring US Dollar strength if it posts a better than expected value. Tuesday the Eurozone CPI is announced but its impact will be somewhat lowered by the earlier release of the German CPI; nonetheless, an increase would be beneficial for the single currency. Wednesday we get a first look into the U.S. jobs market with the release of the ADP Non-Farm Employment Change and later in the day the Fed will release their FOMC Meeting Minutes that will contain insights into the reasons why the interest rate was raised in December. Thursday is a light day but Friday will probably be the most important day of the week because the Non-Farm Payrolls are made public, showing how many new jobs were created during the previous month. As always, this is a very important indicator and its impact is potentially huge so caution should be used; a higher than expected number suggests a thriving economy and thus a stronger dollar. The Pound weakened substantially against the US Dollar during the last week of 2015, allowing the pair to travel almost 200 pips lower and to break support decisively. The current move is likely to extend into the support located at 1.4700 but once this barrier is touched, we expect a bounce higher, possibly into 1.4800. The Stochastic is oversold and curving upwards, supporting such a bounce and the Relative Strength Index is showing bullish divergence (price is making lower lows while the oscillator is just bouncing on the 30 level). These technical factors favor a move up but a lot will depend on the British data released throughout the week and of course, the U.S. jobs report will play a major role for price direction. Three important surveys will be this week’s headlines: Monday the Manufacturing PMI comes out, followed Tuesday by the Construction PMI and Wednesday by the Services PMI. All these are leading indicators of economic health for their respective sectors and higher numbers than forecast usually strengthen the Pound. The U.S. events mentioned earlier will have a direct and strong impact on the pair’s movement throughout the week.